Our 12-day Best of Switzerland tour will have you delighting in the majesty, diversity, and cultural quirks that make this place so…Swiss! From lakeside towns to flowerbox-perfect villages, and hiking trails surrounded by cut-glass mountains — you'll find yourself in a nature-lover's nirvana. Peek at its peaks, marvel at its love of precision, and savor a daily dose of cow-milking, chocolate, and cogwheel trains. Already been to Switzerland? Treat yourself to a generous second Alping. Join us for the Best of Switzerland in 12 Days! This tour stays on Lake Maggiore instead of Lake Lugano. We'll meet at 5 p.m. at our hotel in Luzern (Lucerne) for a "Welcome to Switzerland" meeting. Then we'll take a meandering evening walk through Switzerland's most charming lakeside town, and get acquainted with one another over dinner together. Sleep in Luzern (2 nights). No bus. Walking: light. We'll begin our day with a walking tour of Luzern, learning how a backwater fishing village grew to become a bustling center of trade in medieval times, and one of Europe's must-see destinations on the "Grand Tour" a century ago. Our guided walk will take us through the city's restored medieval core and over its famously colorful pedestrian bridges. This afternoon you’ll find out why the Swiss consume the most chocolate in Europe, sampling a selection to judge for yourself if it’s really the best in the world. No bus. Walking: moderate. This morning, by bus and boat, we'll travel from Swiss lakes to Swiss Army, tracing the tale of William Tell and the birthplace of Switzerland. At the once-secret Swiss army bunker at Fortress Fürigen, we'll see part of the massive defense system designed to keep Switzerland strong and neutral. Afterward, a short drive into the countryside brings us to the charming Alpine village of Engelberg, our picturesque home for the next two days. We'll settle into our lodge, then head out for an orientation walk with free time to wander back before dinner together. Sleep in Engelberg (2 nights). Boat: ½ hour. Bus: 1 hour. Walking: moderate. Nestled between two mountain peaks, Engelberg is the perfect place for an Alpine adventure. We'll begin our day riding Engelberg's unique rotating gondola all the way up to the snowy 10,000-foot summit of Mount Titlis for breathtaking panoramic views (weather permitting). This afternoon we'll gather to tour the town's Benedictine monastery, with its own cheese-making operation. The rest of the day is all yours to explore the vast network of Swiss hiking trails, find a cozy mountain hut offering beautiful views, or enjoy a tasty fondue dinner. No bus. Walking: moderate. Today we'll trade our mountains and meadows for palm trees and a taste of Ticino, the Italian side of Switzerland. On our way, we'll stop in the fortified town of Bellinzona to practice our best Swiss passeggiata. This afternoon's destination is the dolce vita lakeside city of Lugano. Your guide will take you on an orientation walk before we board a boat for our Ticinese cooking class and dinner together. Sleep in Lugano (2 nights). Boat: 1 hour. Bus: 3 hours. Walking: light. It's time to take a vacation from your vacation, on the sunny side of the Alps! The day is yours to stroll along Lugano's shops and harbor, ride the funicular up to the top of 3,000-foot San Salvatore for great lake views, or hop aboard a ferry and cruise to nearby Swiss and Italian villages in search of idyllic open-air restaurants and a little…ciao! No bus. Walking: light to strenuous (your choice). This morning we'll leave the beaches behind and drive to the heart of Switzerland's Berner Oberland. Along the way we'll visit the quaint mountain village of Zermatt, framed by Switzerland's iconic Matterhorn. We'll have free time to explore the village and enjoy the views of one of the most recognizable mountains on the planet — if the weather cooperates. Then it's on to the Berner Oberland. We'll end our afternoon with a thrilling gondola ride from the Lauterbrunnen Valley floor up to the clifftop village of Mürren, where we'll settle in to our hotel before enjoying dinner together. Sleep in Mürren (2 nights). Train: 1½ hours. Bus: 4½ hours. Walking: light. Don't sleep in this morning — the day is all yours to experience some of Switzerland's best hiking. Join your guide for an optional gondola ride up to the 10,000-foot Schilthorn for breakfast with a view of the Eiger, Mönch, and Jungfrau peaks. Later, explore more of the magnificent mountains on one of many walking trails, then find your way back to Mürren. Whatever adventure you choose, you won't be far from the three essential ingredients of the area: cows, cheese, and chocolate. No bus. Walking: light to strenuous (your choice). This morning we'll take a scenic drive to Lake Geneva, up and over the Jaun Pass. We'll pause on our way to visit a working Alpine farm where the area's famous Gruyere cheese is produced and the cows say "meaux." After free time for lunch, we'll continue to pretty and progressive Lausanne, where we'll visit the inspiring Olympic Museum and test our French during dinner together. Sleep in Lausanne (2 nights). Bus: 3 hours. Walking: moderate. It's market day in Lausanne! Enjoy browsing and packing a picnic lunch for our afternoon boat cruise on Lake Geneva (weather permitting). A few miles downshore we'll dock at Château de Chillon, where we'll have a guided tour of this delightfully medieval castle on the water. On our way back we'll take time to peek into the Lavaux vineyards for a wine tasting before returning to Lausanne. Boat: 2 hours. Bus: 1 hour. Walking: moderate. We'll begin our day with a time-travel visit to the village of Avenches. Two thousand years ago, as ancient Aventicum, this was one of the largest cities in the Roman Empire. A short drive catapults us a thousand years ahead to Bern, the country's present-day capital and our final stop. After a guided tour of the city center, we'll sit down with a local for a cultural Q&A session on all things Swiss. Tonight, we'll gather for a farewell dinner together, where we'll share travel memories and toast new friends. Pröschtli, cin cin, and salud! Sleep in Bern (1 night). Bus: 2 hours. Walking: light. Breakfast is provided, but there are no group activities today. It's a breeze to reach Zürich's airport by train (75 minutes, 2 trains per hour). You'll have easy connections to home, or on to other points in Europe. Tschüssli! Adjust to frequent Alpine weather changes that can interfere with sightseeing. Enjoyed the tour very much. Switzerland is beautiful and the 12 day trip allowed us to see it's diverse geography, culture and people. "Hiking down from Mt. Titlis, hearing the Swiss cowbells and eating the local cheeses and cured meats! It was a great day." Switzerland has vistas so beautiful they defy description. A refreshing model of unity embracing the diverse cultures and languages that comprise this country. Leader Yorick was organized but flexible, and accessible whilst encouraging independence. A wide variety of experiences, and mostly good weather to enjoy them. (Snowy Murren was pretty, but we missed the spectacular view. Add a day here!). Hotel rooms were small but clean.We enjoyed friendly fellow travelers and our skilled bus driver. "From bunkers to bovines, each day had wow moments. Loved the cooking class dinner with its candlelit meal lakeside, the cheese farm lunch and mini- concert, wine tasting overlooking the sunlit vineyards and sparkling lake, the camaraderie of "happy hour" sharing stories and experiences, and Diccon's personal forum in Bern tying together all we had seen and done. Glad for my hundreds of photo memories of snow- capped peaks, lush green hills, deep valleys and broad blue- green lakes and rivers." "Really, Switzerland is a wow a minute! Every mountain climb was thrilling- including the funiculars, ski lifts and gondolas that took us to the top. I also very much enjoyed the cheese farm and the couple of hours we spent at the vineyard sampling the wine. Along with the military fortification, these stops are highlights of our trip that we would not have been able to find on our own." It was "good" and I enjoyed it, but it did not "wow" me like previous Rick Steves tours (Scandinavia, Heart of France, Heart of Italy). "Nothing really WOWed me. I really liked Trummelbach falls (near Murren), Swiss Transportation Museum (near Luzern), Museum of Communication (in Bern), and Swiss National Museum (in Zurich) - all done on our own. The Alps (Engelberg, Zermatt, and Murren) all had the potential to wow me, but all were fogged in." Enjoyed doing outdoor nature activities in Europe. Enjoyed tour. Not as happy with allocation of free vs. tour time as previous RS tours. Some days had few activities, others too tightly scheduled. We rushed away from Murren to visit Gruyeres which wasn't worth the trade-off. Too little time in Murren. Need 1 day for Peaks/Alpine trails and 1 day for Lauterbrunnen. Time in Olympic Museum short; Little free time in Lausanne. "Liked lake & hiking in Engelberg. We enjoyed Trummelbach Falls and the Lauterbrunnen Valley falls - not part of the tour. Our gondola to Schilthorn was cancelled for bad weather; next day was clear early, but we had to leave at 7:55am. Some accommodation for weather to 9 or 10 am would've been great! That was a potential Wow! We liked city walls in Lucerne, not even in your book, not mentioned by our guide. Matterhorn also fogged in." Yorick was very professional, extremely knowledgeable about the country and the culture, and was very patient with the tour group even when the same question was asked repeatedly. He showed patience and kindness. "Going up to the top of St. Pilatus. Also the defense system tunnel and the Landwasser viaduct (which we toured on our own)"
Yorick was amazing with his knowledge of Swiss history and the history on the individual cities we visited. The towns that we visited were all interesting in their own way, but I suggest longer stay in each city with moe free time. "Hiking in Murren. I would have loved to stay an extra day in Murren." I enjoyed having free time to explore on my own. Staying two nights at a hotel makes travel so much more relaxing. Our guide York was very helpful. "Murren- It snowed and it was like a winter wonderland. We were blessed with great weather." "Engelberg was amazing and just as I pictured Switzerland to be. I would imagine Murren is also typical Swiss but we had rain and clouds." Our experience on the Best of Switzerland tour was fantastic. While I am partial to the flexibility the My Way tours offer, this fully guided tour included several memorable highlights. Dinner in Lugano where the group prepared our own risotto for dinner, the visit to the home of the dairy farm to sample their cheese, and the wine tasting at the vineyard overlooking Lake Geneva - all were great additions to the itinerary. "Rain, snow and fog prevented us from truly enjoying the majesty of the Alps when we visited Murren. So, I would have to say our visit to Mt. Titlis delivered. It was a crystal clear day and the views from the top wowed us all." Switzerland is an incredibly beautiful country. We had outstanding weather which made each locale and the bus/train/boat journeys so much more enjoyable. The tour included a really nice variety of different experiences from a dairy farm to a cold war era military installation. "The Swiss countryside, mountains and lakes provided many wow moments." Our tour experience was excellent. It was a nice blend of group activities and personal time to experience Switzerland on our own. Our guide was very good at explaining the local and national history at any given location. We really loved the historic and cultural places your tour chose for us. We have a much better grasp of Switzerland's place in history and and its role in European history/geography. The hotels,restaurants, trains, buss and local tours all exceeded our highest expectations. "While the scenery was spectacular, my personal "wow" moment was to see my family name on a plaque on the wall of the Bern cathedral. It really inspired me to more fully research my family roots back to Switzerland!" Switzerland is picture perfect in every direction, and the tour helped me appreciate many wonderful aspects of the country. Very well chosen things to see and do and experience. "Very hard to decide -- perhaps hiking in Engelberg at Mt Titlus(?). Just like all the movies and pictures people see about Switzerland." We had a great group to travel with; a mixture of RS repeats and some first timers. It was fun to share other tour experiences with them. Switzerland was beautiful and the weather really worked with us...from sunshine to snow. Yorick kept the group on a comfortable pace and kept us informed of possible changes to the itinerary (weather dependent). He readily shared his knowledge of Switzerland; I was impressed by his command of the many languages of Switzerland. "I didn't have a particular moment. I just loved the raw beauty of the country. Our time at the farm was special when our van driver played the flugelhorn and we had a little concert while enjoying their delicious cheese. Group bonding was a great time at the Grotto; the food was great." Very enjoyable itinerary; generally had enough free time. Hotels were very good choices, reflecting the areas where we stayed overnight. Included dinners were 50/50; mac and cheese with potatoes was interesting to hear about, not so much to eat. "The trip to visit the dairy farm where they made cheese. Not so much wow as it was the real deal; life as they live it. Very enjoyable, guide played Swiss music and yodeling during the drive there, lovely combination. Very scenic and memorable. And, I have to say, one wow moment was the Olympic Museum, wow, how could they make it so bad? That museum was worthless and a waste of time and money. I say toss it and find something to replace it with on the tour." We had an amazing time on this tour. Martin was an excellent guide and did a nice job of "switching things up". Every day was a different sort of adventure. Plenty of free time to go exploring on your own. The local guides that were chosen were great. Martin did a wonderful job of giving us an in depth cultural experience. "There is not one "wow" moment that I could choose; there were many "wow" moments! When you are standing by a lake with the Swiss Alps in the background or standing at the top of a peak and looking all around at the beauty of the country, well, it's hard not to have a "wow" moment... pretty much every day." This was my first Rick Steve's tour and I had an amazing trip to Switzerland with our group. Loved every minute. We certainly lucked out on weather the whole way - wishing I had taken a few more clothes for the warmer weather instead of warmer clothes for cooler weather. Had to purchase a couple of cooler tops to wear. Every day was an adventure! The options to undertake on our free days were perfect in every way. The tours as a group were a lot of fun and very well organized. "For me being up in the Alpes was my "wow" moment or moments. Beautiful view from Mount Pilatus. Mount Titlis was amazing - walking across the suspension bridge and walking through the ice cave! Seeing the Matterhorn and the glaciers. The village of Murren was beautiful! Experiencing all the different modes of transportation that we did was great." Switzerland is a beautiful, clean country with the spectacular Alps adding to the beauty. Our Rick Steve's tour was excellent and I would not hesitate to take another tour. Everything was well organized- hotels centrally located and very nice; food excellent; day trips outlined many highlights that Switzerland had to offer, and free afternoons offered us time to explore on our own. Martin, our guide, was excellent- very knowledgeable, approachable and offered humour to our days was fun. "Lucerne was my favorite introduction to Switzerland. The wooden bridges with flowers everywhere with the Alps in the background. There was so much to see in this town- the "lion" sculpture, walled part of the city, funicular, river, cobblestone streets. This town was quaint-easy to walk everywhere. Mount Titlus was pretty spectacular with views, glacier cave and suspension bridge." It was great being introduced to the diversity of Switzerland--German, Swiss German, Italian and French speaking geographic areas by our outstanding guide. "I really enjoyed being in Murren and the surrounding area but I also througeh enjoy Luzern and Lausanne as well plus all the beautiful scenery." The tour, travel group, Martin's humor and expertise, the setting far exceeded my greatest expectations. This particular tour was recommended by a couple when we were together on the Village Italy tour last year. "It's hard to say because there were so many. Probably the Murren area." I had high expectations and all of them were met. The tour had exactly the right balance of unique Swiss destinations with plenty of time to explore each location with the group and on our own. Switzerland is a small country but amazingly diverse and stunningly beautiful throughout. Our guide ensured we maximized the experience without feeling rushed. Highly recommended. "With a trip this well put together there were many competitors for my favorite moment. But just edging out the group dinner in Lugano and the hike though the Engelberg Valley was the moment in Murren when the clouds parted after a foggy morning and all at once above us appeared the snowcapped peaks of the Eiger, the Monch, and the Jungfrau. I've never seen anything like to compare." Martin made our already good tour into a GREAT ONE!! We couldn't ask for more. His insights and knowledge made us feel very comfortable in HIS country...We are already signed up for Sicily 2019! "The Alpes were our favorite part of the tour. Trips out of Murren were excellent." "Taking the tram to the Matterhorn. Stunning!" What a fabulous tour. I enjoyed a variety of accommodations staying in the small centers with quaint hotels in the down town area as well as mountainous views from our chalet. We experienced multiple means of travel including hiking, trains, buses, Metros, boats, gondolas and funiculars. All added to our overall experience of discovering Switzerland at it's best! "The scenery had to be the wow factor for me. We kept repeating "How can it get any better than this"? Yet it continued to amaze every day. The tour provided a wide selection of landscapes to enjoy." This tour was very well organized and took us through an amazing section of Europe. Some of the days were a bit overwhelming and adding a day or two to the agenda would help that. Great mix of mountain and lake experiences. Enjoyed the dairy farm visit as well as the night of the cruise and making risotto. "Our time spent in Murren was incredible but Engelberg was a very close second." My overall tour of Switzerland was beautiful, relaxing and fun Traveling with this Rick Steves group of people was very enjoyable and memorable. "The clifftop village of Murren. Just loved the view, the food and people"
"All of the amazing views"
Yes,an outstanding travel experience in all respects. We especially liked the pace and spacing of the tour. When we arrived in a new city/location the orientation and welcome dinner allowed us to use our free time the next day so much more effectively. As for our tour guide, she was exceptional in her knowledge, communication skills and ability to relate to all. "I loved Lugano, "Italy run by the Swiss" and our walk on our own to Gandri. It was very special. The boat ride on the Lake was also special. I also found the Castle Chillon to be absolutely amazing followed of course by a wine tasting at a 14th century winery. My last one was in Engelberg at the Dominican Monastery when we had a monk who lives in the abbey give us our tour. I have been in many churches etc in Europe but he made the whole thing so real since he was actually living it." This tour covered enormous territory for such a small place. The bus rides along the high curvy roads to our destinations, along with Maisie's excellent narrative, provided insight about the role of the Alps in Swiss history. The local guides were all very knowledgeable and gave informative, enjoyable tours. Loved the monastery tour in Engleberg, the dairy farm in Baderalp, the Lugano risotto experience and of course the wine tasting in Lausanne. "My favorite "wow" moment was the 360 view at the top of Schilthorn in Murren, incredible. I also enjoyed the cliff walk on Mt. Titlis. For local flavor I really enjoyed the visit to the dairy farm at Baderalp, loved the cheese and the music!" "Stepping out on Hotel Alpenruh balcony early next morning after late (dark) arrival night before. Terrifying, breathtaking and exhilarating! Sun rising and illuminating slopes of mountain peaks - gorgeous! Loved all the varied modes of transport: gondolas, funiculars, steam-driven boats, trains,"
I was very impressed with the itinerary and the variety of planned activities. Information imparted from The guide, local guide and others helped me to know the Swiss. "Dinner cooked together and the mountain scenery were the two "wow" moments of the trip." Our tour was memorable, filled with great experiences and great people. Maisie is a very skilled and pleasant guide very enthusiastic, knowledgeable, patient and a great sense of humor! With her guidance we were able to negotiate the cities with no problems and found some gems on our own too. The only other Rick Steve's experience I have had is the 17 Day Best of Italy that I took with family in 2007. I recall it being a more relaxing trip, with more free time. This trip was booked solid. "The boat tours were very relaxing and the mountain experiences were the best! Rick Steves Tours best features are the unusual "off the grid" experiences like the farm and the risotto cooking." It exceeded my expectations. We were able to see and do much more than trying to do it on our own. "Walking up the lane to the high farm to see cheese making - hearing the bells around the necks of the cows - I realized we really were in Switzerland." We were able to experience so much more on this tour than doing it on our own - The chocolate tasting, risotto making and dinner by the lake, the Benedictine abby tour, stopping in Bellinzona and Gruyere. We also learned a lot from Maisie and the other tour guides. Our bus driver Jeanette was an excellent driver and I felt very safe. It was nice to experience, gondolas, boats and trains too. The bus was roomy so we could spread out. "Everything about Murren! Our hotel was great and the view from the balcony was wonderful! the whole little village. Even though the hike from Murren to Gimmelwald was very strenuous and hard on the back and hips, the scenery was breathtaking. The cheese fondu that night was delicious. The gondola ride and views at the top were great. The cheese farm visit afterward was memorable walking up their drive, hearing the cowbells tinkle. The farm lady yodeled a birthday greeting for one of us." The places we went and the tour guide were great. "View from the Bond restaurant." "Murren was the the high point of the trip. The hike on the North trail was stunning. The Eiger, Munch and Jungfrau were at their best. NO clouds to block the view. The cows were friendly as were the goats. The pigs were a bit standoff-ish, but that is a pig for you. WE were exhausted, but wanted more, more mountains, more cable car rides, more trains through mountains, like another day in Murren (hint, hint...)"
A wonderful country, very happy with the tour, our guide and logistics provided ie. transportation and boarding, were all great really enjoyed being in the center of the places we visited, every place we stayed the people and staff were wonderful. "It would have to be Murren, if I would change anything it would be another day spent there." Loved the small group of people we toured with. All like minded and fun to be around. "Murren, definitely Murren. All the Hotel rooms faced the mountains. We sat out on the deck and ate lunch and sipped wine, just enjoying the view. Plus hiking the trails." This was my husband's and my very first Rick Steves tour. We could not have chosen better for our first one! We did this one, because I am half Swiss. It was beyond what I could have imagined. I absolutely loved it! "Probably in Murren when I stepped out of my hotel room onto the balcony and saw the mountains. Incredible, gorgeous, breathtaking! There is so much more I could choose. I loved everything!" This tour did exactly what I wanted [except I would have wanted more]. It was a well thought-out blend of what Switzerland has to offer that seemed to meet the varied needs of those on the trip. Some in the tour were into the mountain experience [hikes, views, etc.] while others were willing to just absorb the environment more passively [me]. The design of the tour made this possible. The weather and the knowledgeable/friendly guide helped tremendously. "The time with Diccon talking about the Swiss was the best part of the tour for me. Lucern was also special. I really enjoyed the architecture and the history of the region. It was a great intro to Switzerland. I was also impressed with spectacular views afforded by our mountain hotel." As always, exceptional. The perfaect balance of informative guided tours and time on our own to explore. Beautiful scenery and hiking for all levels of hikers. "The views from atop of Mount Titlis were indescribable." The tour was wonderful! What a beautiful country,and such kind people. I always like that we stay at the hotels at least 2 nights, making it feel more relaxed,and not just living out of your suitcase. Having the free time is great. We get to explore some things on our own that may not be included in the daily events. I also really enjoy that it's a small group. You truly get to know each other and get to be more up close and involved in the events and sights. "My favorite??? I was blown away by the view from my room in Mürren. I opened the door and literally a jaw [INVALID]ping view! I loved the dinner and risotto demo at the café on Lake Lugano. To sit back and enjoy the great food and wine, the happy chatter and laughter of everyone, along with the beautiful sunset was truly magical." We have taken 6 Rick Steve's trips and Switzerland certainly is one of the top ones. The majestic beauty of the Alpes cannot be beat!!! (and we're from Colorado with the beautiful Rocky Mts). As always the tour features special events like visiting an authentic cheese making farm where the family members also play the alpenhorn, accordion and female yodels; visiting a family owned business with 4 employees making handmade chocolates(Yum!! ); and an evening making risotto that we all ate. "In Murren hiking the North Face trail viewing the spectacular Eiger, Monch, Jungfrau range in glorious sunny amazing weather was WOW! WOW! WOW! and sitting on our balcony across from those peaks was heavenly!! Engleberg and the Titlis Mt. experience ranked 2nd in beauty and enjoyment for us. On our free time in Luzern, taking the Mt. Pilatus Golden round trip by rail, steepest cogwheel in the world, and gondola was truly amazing." Good experience Enjoyed historical recount of the different areas by our guide. "Staying in Muren, Switzerland. Would like a longer time there than just a day." My first Rick Steves tour and it was amazing! Had a great group of people to start with, and Yorick was fantastic! He had a lot of ins and outs, things like being first on a tram, got us to the top early, and our walk through an ice cave was virtually by ourselves! Was really impressed with his knowledge of the history of the area. Even more impressed with his mastering of all the languages he knew. The local guides we had were also fantastic. "The whole trip was amazing, but I was extremely fond of Murren. The tram to the top of the mountain with breakfast in the revolving restaurant, with the stunning views. May have been the hike from the train station 2 villages over back to Murren, with the amazing views of the 3 peaks!" There was not one part of our tour that I didn't appreciate. I loved the way were were escorted into each new area and celebrated the different locations with eagerness.I was enthralled with the different areas of Switzerland and came to love each area. "Hiking in the Berner Oberland and everything about Murren. The Alps were stunning and I can now tell my friends that I saw the Matterhorn, even with a little cloud." We loved The scenery was beautiful everywhere you looked. We walked up to the Hotel Des Alpes for lunch and enjoyed the beautiful view all around us. We also enjoyed visiting the many lovely churches. The views of the mountains and the lake are definitely breathtaking! We loved the beauty in Engelberg, experiencing the beautiful Alps, hiking and enjoying the gentle cows with the sounds of cowbells echoing all around us! We loved Lagano,and cooking our dinner. "Our favorite WOW moments were in in Zermatt and Mmurren. Viewing the Alps, going up the lift and traveling through the snow tunnel, hiking around and viewing the Matterhorn! The amazing view from our beautiful Hotel balcony was the biggest surprise! WOW,WOW ! LOVED hiking there! Loved the gentle cows with their bells everywhere!" Beautiful Country, good group, excellent guide and overall, just a delightful tour. "The Alps! The sights were breath taking !" "There were so many "WOWs"! Certainly the views of the Matterhorn and the Jungfrau and other mountains to the beautiful green valleys to the chalets dotting the velvet green slopes. Hiking along the North Slope from Murren was a bit more hearty than I expected, but very very worth it!" Terrific! We saw so much of this beautiful, historic country....mountains, lakes, meadows & cities. we travelled by boat, bus, gondola, funicular, train, etc. We were lucky with excellent weather. The hotels were all local and very adequate. "Pretty much every day was a "wow". My favorite was a "optional" hike we took in Murren led by our guide Martin. The scenery was amazing; pure Switzerland." Visiting Switzerland has always been high on our bucket list. Having been on previous Rick Steves tours of Ireland and Spain we knew this tour would not disappoint and it surely didn't. Absolutely wonderful in every respect. "The view of the Alps from our hotel veranda in Murren. Simply breathtaking!" The mountains of Switzerland are outstanding in their own right but viewing them is greatly dependent on the weather. I was fortunate that only Pilatus was obscured by heavy clouds. Even the Matterhorn was visible on a mostly cloud free day. "No particular ' Wow ' moment, as the continuous view of the mountains was impressive." Switzerland is a very beautiful country and I enjoyed the tour. We had plenty of free time and options to do what we what we wanted. Martin was very helpful and being Swiss but living in the US gave him a good perspective for both nations. Hotel rooms were usually very small but workable. "The cooking class in Lugano." Well planned tour. The key to success was our tour guide, Martin. He set a good pace and was always tuned in to the needs of the tour members. I thought we had the right amount of time in each location. I particularly enjoyed learning about the Swiss culture. "Our time in Murren. The view from our hotel was fantastic, and the hike that Martin led had an unending number of wow moments." Overall this trip ranks in the top 3 of the 6 Rick Steves trips I've taken. Switzerland is an extraordinary country. The intelligent planning and attention to detail served to stimulant not only mind and body, but the soul as well. "On a day-to-day basis our guide, Martin Minnick, delivered one wow experience after another. Beyond that, I think I have the warmest memories of our risotto making cruise & grotto dinner while in Lugano. Of course the time spent in Murren left it's indelible mark on my sensibilities. In fact, if given the choice between bypassing the Matterhorn in exchange for more time in Murren, I would gladly do so. The view from our hotel room was at once breathtaking and heartbreaking." Loved every minute of this tour. The beautiful scenery wherever we went, the friendly people in the group, and our excellent guide, Martin. The weather was perfect - much better than the forecasts. Fun towns in which to spend time. Good combo of together time and time on our own. Group tours were enjoyable. "The entire trip was a WOW!" Switzerland was always a country I wanted to explore and this trip was perfect in showing me a wonderful sampling of what there is to see. Loved the beautiful lakes and the cities that sit on those lakes. They were magical...Lake Lucerne..Lake Lugano..Lake Geneva. The castles were fun to explore and the countryside was gorgeous...the green green of the hillsides with the cows grazing with their bells ringing...the high and snow covered Alps were amazing...and beautiful flowers everywhere. "It is a toss up between the beautiful lakes but during the day and at night and Murren with the steep cliffs, snow capped mountains and green meadows crisscrossed with wonderful paths to hike. Really glorious." This was my third Rick Steves tour and it was fabulous!! Prior to the trip, I knew that Switzerland has several different languages, but was so fascinated to learn that the country actually has four official languages with very distinct regions and cultures. Our itinerary took us on a beautiful loop through scenery as spectacular as I had imagined. We visited several mountain summits and my husband and I did a couple of additional ones during our early days in Lucerne prior to the tour start. "There were so many, but Murren was breathtaking. Our hotel room faced three of the most famous peaks in Switzerland. Other favorites places included Lake Lucerne, Schilthorn, the Matterhorn and Mt. Titlus. The cheese farm was also really fun and the wine tasting near Lausanne was fantastic. Another unique RS tour experience was our happy hour in Bern with Diccone sharing such an intriguing range of topics on all things Swiss. It was a really great conversation and Q&A." This tour is an excellent overview of Switzerland, its culture, people, geography, language, and vistas. The mountains are breathtaking, and the hotels we stayed in were for the most part very good and clean accommodation centrally located and when available with beautiful and the sweeping views of the majestic Swiss Alps. We were well taken care of by our well informed, enthusiastic, and caring guide Maisie Hitchcock and the efficient, skilled bus driver. Excellent scheduling well managed. "There were many and the one that stands out above all the rest and only available in Switzerland, staying in the Heart of the Alps, at 6,000 feet, in Murren, in a hotel at the edge of the mountainside, my room with a balcony with sweeping views of the Lauterbrunnen Valley 6000 feet down and all the way up to the top of the 10,000 feet high mountains. Second to this wow moment was the thrilling gondola ride from the valley floor up to the clifftop village of Murren and the return gondola ride." Really nice group of tour members, and–as usual–an exceptional tour guide in Maisie Hitchcock, and Jeanette–a lovely driver who really knows how to move a bus! We'd been to many of the stops on the tour, and were hoping for better weather, which was really the only downside. "Like most of us, I go to the store and buy "cheese" or whatever is on our shopping list without giving it much thought. So seeing the couple and their adult son who raise the cows, provide a pasture for them, put up and take down fencing every year, milk the cows twice a day...and only then begin the arduous process ofactually making the cheese...WOW, what a LOT OF WORK! No wonder she wanted to yodel and play the accordion for us! Great insight for me." This tour was THE BEST one so far! I felt it was quite underrated. Little did I know how spectacular the landscape was in Switzerland. I enjoyed how we jockeyed lakes, then mountains, the lakes, then mountains ending in Bern - more water! Our tour guide, Maisie, was fabulous and fun - she was quite well versed on the history and others issues and I oot a big kick out of her witty sensibility. The hotels were wonderful - we had some great rooms with great views. "The view from our room in Murren - I am strongly considering going back on another tour that would get me back to Murren for at least 3 nights. LOVE this place." The tour members were a good fit and gelled well together. Maisie was an excellent guide and talked freely with tour members. "Visiting the Swiss farm cheese making and the trip up to the Schilzthorn, except for the fog. I enjoy the more rural, country visits. The Chillion palace was also great." We enjoyed our tour of Switzerland. I was disappointed that the weather was so poor in Engleberg, preventing us from witnessing the breathtaking views from our gondola ride on the way up to Mt. Titlis. However, as our tour continued, the weather improved giving us sunshine in beautiful Murren. Our guide, Maize, truly made our trip delightful with her wonderful sense of humor and knowledge of the country. "When we got to Zermatt, we were unable to see the Matterhorn as it was engulfed in clouds, which is what we were expecting as the weather hadn't been very nice. However, we started to notice the clouds slowing parting, so we took a seat and waited patiently. Little by little, the clouds drifted to reveal a spectacular view of the mountain. It was truly a WOW moment." I thought the itinerary was well thought out. The organization and leadership by the guide was flawless. I believe we experienced a good representation of Switzerland. "The scenery along the coastline of Lake Geneva. The skyline in Murren." Great as usual.....just wish the weather had been a little better in some areas. "Parasailing over the Murren Valley at about 4,000 feet!" This is my third Rick Steves' tour and they just keep getting better! I really loved this trip. The natural beauty of Switzerland as well as the educational and cultural aspects of the tour melded perfectly into an almost perfect vacation. I love hiking and walking so I really appreciated the "free" time given to pursue these opportunities. "The "wow" of the mountains combined with the "wow" of the lakes." It was amazing, better than I ever anticipated. It confirmed why everyone else in our group was a repeat customer. There were special surprises everyday, whether it was the thoughtful treats from Maisie or the wonderful music events we happened onto. The scenery, people, hotels, Maisie and other special guides, activities, bus driver and group all were outstanding. "I felt like I had traveled to three different countries. Each area was special and unique, from the language and food to the architecture. I was not expecting that and it was a pleasant bonus." The tour was well organized. We had a good representation of the country, the itinerary was well thought out. Our tour guide was very accommodating and tried to be of help to all. Fortunately, the group was very compatible making it easier for the guide and more enjoyable for us. "All of the places we went in Switzerland were WOW moments. The scenery of both Luzern, Lake Geneva were just great. The time in Murren the gondola ride up to Schilthorn would have been the Wow moment except for the fog - we didn't see anything...."
Mazey (? )our tour guide was outstanding! We enjoyed the others on the tour. Liked the villages, cities and activities. "Meeting another tourist who is from my hometown! Bellingham, WA." My husband and I had a fantastic trip in Switzerland, particularly due to our wonderful tour guide Maisie. We enjoyed her wit and wisdom of all the locations and all the languages she knew. We especially liked the time we spent in Murren and wish we had just one more day there. We tend to enjoy the smaller villages when we travel. "I have to say our time in Murren. It is such a beautiful village and there was so much to do." This was a fun tour which included many different regions of Switzerland, and different aspects of Swiss culture. I loved being in the wonderful mountains (Murren; Engelberg/Titlis; the Matterhorn; and Pilatus during free time in Lucerne). Nice mix of Swiss cities and small towns. "The tour to the remote, family-run cheese farm was outstanding, as was the tasting experience at the artisanal chocolate store. These are the kind of unique experiences I value on RS tours. Instead of taking us to a huge commercial chocolate or cheese factory, we got to see these Swiss specialties in a personal, individual way. Kudos to our guide for finding such wonderful locations!" I couldn't be happier with my tour in Switzerland! Everything was very well put together! The tour guide Don went above and beyond to make everything work smoothly for us. Our bus driver Ditre was amazing and all of the transport went like clockwork. It was nice to be able to see everything without having to worry about making the arrangements. I will definitely be going on future Rick Steves tours! "I actually have 3 WOW moments! I was able to go to the top of Mount Pilatus, Mount Titless as well as The Schilthorn and had a clear view of the Alps from all of them! Going up the Schilthorn first thing in the morning to have breakfast in the revolving restaurant was truly magical!" It was a great tour and we now can take Switzerland off our bucket list. Switzerland has some special features that you do not see in other countries. We both want to go back an see other parts and do other activies in the near future. Some of the local waling tours exceded the ideal duration of 1-1/2hours. This tour had a high activity rating and there was a couple of days where we were worn out, but that was our issue because we did not get in top shape for the activites required. "I think the three mountain ventures would be the top wow monments. We were very foutunate that we had sun shine on all three excursions"
Overall, the tour was very enjoyable with just a few tweaks that I would recommend for future swiss tours. Don, our guide, did a great job with the group and seemed to be very knowledgeable of the area, the history, the people, etc. "Our favorite 'wow' moment was not something that can be controlled by Rick Steves. It was in Murren. We had had just A+ sunny warm weather over the whole tour and we prepared (on our free day) to have a 'hotel room picnic' on the balcony of our room which overlooked Murren, the canyon, and Mt Eiger. Just as we sat down with a glass of wine, the weather changed and a storm came in. We were in the perfect place to enjoy it. Secondly, on our first night in Murren, the Alpenglow was just great"
"There were several "wow" moments but probably the Schiltorn tram and Titlus." First time tour participants. and visitors to Switzerland. What a beautiful country! Loved the structure of one day planned, one day flex time. Lots of suggestions for down time. So enjoyed meet & greet night. Really set the tone for the trip & "Buddies" proved invaluable. Bonded with lots of interesting folks, relaxed, learned lots & Can't wait for another exciting tour in the future! "Truly there were many. From seeing the Matterhorn up close & personal to having a private breakfast at the top of the Schilthorn while rotating in front of the the Eiger, just spectacular!" Wonderful, Amazing, the mountains, lakes, castles, churches, history, the wonderful group of people both first timers like us and old hands that had been on 7 Rick Steves tours. The tour guide Donald was both knowledgeable and fun. "I have to say that most of the tour was wow moments. Luzern, Engelberg, Murren and the cheese making stand out, but seeing the alpine glow on the mountains from the hotel in Murren, has to be one of the top moments!" I have been wanting to tour Switzerland for many years and this trip met my expectations in most areas. I wanted to experience the Swiss Alps and there was plenty of opportunities. I have been on a number of your tours and Donald ranks near the top as one of the best and most experienced tour guides I have had. I wish we could have at least one more day in Murren as this area is the epitome of the Swiss Alps. The two boat trips we took were also highlights of the trip. "Sitting at dinner in Murren and looking out the window at the alpenglow !" Really enjoyed this tour. My favorite days were those that included trips to the top of the Alps. The hotels in Luzern and Murren were outstanding for their location and their views. Only wished that we could have stayed in Murren one more day. Our guide, Donald, was outstanding. He provided a wealth of information about the locations we were traveling to, plus many suggestions about what we might see or do in our free time. Our bus driver Deiter and the local guides were all very good. "The top wow moment for me was the ever changing view from the hotel balcony in Murren. The view of the mountains across the Lauterbrunnen valley kept changing with the evening sunlight, clouds and even a rainbow." This was really a wonderful tour. The group was good. Don was excellent. Being from Colorado, i am at home in the mountains. I enjoyed seeing the Swiss mountains Getting around by all the various modes of transportation was great! "Tram up to Gimmelwald and Murren. Such a beautiful area. I want to return and spend more time there." "My husband said it !!!" Outstanding tour experience. Donald was an excellent tour leader, providing timely, appropriate and interesting information on-time. Very responsive to the entire group. The pace of the tour was very good, with appropriate time for individual activities. Hotels were terrific, especially in Lucerne - perfect location and Murren. The tour and weather were perfect allowing us to accomplish all of our viewing objectives. "The Matterhorn viewing in Zermatt at the top of the funicular and restaurant." "There are several but I would have to say the view of the mountains from our room in Murren. It would be nice to have stayed there longer and hike through the area and spend more time in Gimmewald. However, I don't know where else to cut short. Possibly Engelberg but I really loved that also. Why wasn't Engelberg in the guide book??? Also loved Zermatt and seeing the Mattehorn. We were there for the annual folk festival which was fun to see but there just wasn't enough time." The trip was wonderful. Our guides Maise and Holger were always one step ahead of any issues, and had the knowledge to make each stop a wonderful learning experience. They also were simply delightful people and made the experience fun and their friendship something to remember. I really enjoyed the hotels and stops selected by Rick Steves Tours. I thought we hit the highlights without being one of the "regular" tourists. The pace and freedom to have your own experiences was a perfect. "Murren is without a doubt our image of "Switzerland". Taking a longer hike there along the mountains, looking down on the village and across to the Eiger, Munch and Jungfrau was something Iwill never forget!" At each location we had excellent information and guidance as to what to do. Our guides were wonderful and the group was a lot of fun to travel with. We felt we got a great overall look at Switzerland and enjoyed the variety of locations we stopped at from Luzern to Bern. We really enjoyed the special opportunities to mix with the "locals", which we felt enriched our tour experience a lot. "We especially loved our time at Murren! The 2 1/2 hour hike we took with Holger, up in the Alps above Murren was outstanding and unforgettable! Amazing scenery!" This trip was the experience of a lifetime. Our quides were wonderful, our group of travelers were the friendliest bunch ever and the cities and towns were exceptional. I cannot explain the beauty of Switzerland, it is beyond compare. So many things on my bucket list were fulfilled. We had perfect weather, albeit a wee on the warm side, but Mother Nature will have her way. I would recommend this trip for those who love beautiful mountains and wonderful cities. "The views from the top of the Schilthorn and the Matterhorn. But there were too many moments to point to just two. From exquisite sunsets to medieval towns and castles. We ran into many town fairs and saw parades and cow bells being rung in Murren. Waterfalls roaring after a rain shower and the peace and quiet of alpine walks. I left with my heart full." "Looking back from a mountain pass at 6000 ft and seeing the lake at the bottom of the mountains and the sun reflecting off the ribbon of highway that we had just taken that snaked up the hill to the pass. The depth of the view was spectacular." This was the first time that my husband and I had done a packaged tour like this and I was a little nervous that it would be too slow moving and limiting. The opposite was true! We were constantly on the go seeing beautiful and interesting sights! It was very relaxing letting someone else worry about the schedule and the tickets. All we had to do was enjoy the beautiful country! And the other folks on the tour were friendly and interesting. And I loved our leaders, Maisie and Holger! "Hiking in the Alps near Murren. It was a perfect day and the scenery was amazing!" I really loved the tour. Clearly the high alps were the highlight. This trip will always be remembered for the nights in Murren and the views of the Eiger, Monch and Jungfrau. We were treated to the alpenglow at sunset. I also found the Olympic Museum to be "can't miss", although other in our group were less impressed. "The view from our balcony of the Chapel Bridge in Lucerne was the "WOW" moment. The Hotel Des Alpes was lovely. Not much we could do about the heat. I very much enjoyed touring Switzerland on August 1, National Day. The festivities in both Altdorf and Engelberg were enjoyable. However the attempt to "spot" the Rütli Meadow took a lot of time and probably could have been skipped." Our first Rick Steve's tour was wonderful. We would.go again. We were celebrating our 55th wedding anniversary. All our many experiences were well organized and informative. Loved our tour guides and travel mates. Everyone was friendly and on time I only wish we would have had an extra day in Mürren. We really only had one full day as we did not arrive till evening on first night. Not enough time to explore the most beautiful area. This is the are we wanted to see more of. "Mürren. Give me more time Not enough time to visit Lauterbruin valley. Skip maybe Zermat. It was long day. With train and bus"
Switzerland's scenery is awesome! Our leaders helped us to understand the culture differences within the country and the history. The days were full, but with enough time to savor the experience and enough free time to explore on our own. Our leaders made the time fun and brought our group into friendship. "Hiking in Murren was very special!" We have done a number of coach tours. This was our first Rick Steves tour.. Friends have done numerous RS tours and recommended we give it a go. We thought it was excellent and would heartily recommend RST to others. Switzerland is our favorite place in the world and we have been to many of the places before that we visited on this trip, so we could really focus on the beauty and grandeur that is Switzerland this time. Joining Swiss friends post-trip made this trip especially nice. "Visiting Merren, Gimmelwald and Lauterbrunnen again"
Nice diverse group- we often travel w OAT and enjoyed having some young people on trip (teen-young adults w parent) Hotels were in great locations- except Lausanne- would have preferred by lake- and overall we nice- so hot! Air conditioning would be nice! "Morning we left Mürren clouds finely were gone and we could see entire mountain range- wish we could have gone up the gondola THAT morning for breakfast! But gorgeous"
Switzerland is beautiful, and the trip was was definitely memorable! I do feel that it could do with editing certain activities, giving more free time. Maisie is an awesome guide--very helpful with transportation questions, and gave very helpful suggestions at each location. Experienced a lot in 12 days, but would love a trip that focused solely on the smaller Alpine locations. A very nice overview of Switzerland, touching its mountains, cities, and culture. Guide was excellent! "Boat trip/tram to Mt Pilates and hiking the Brunnihutte area above Engelberg. Both recommended by the guide." Switzerland is a great country and I'm glad I went. We really needed an extra day in Murren. There was so much to do and so little time. As the weather was cloudy at the mountain peaks it wasn't appropriate to go up to the Schilthorn but the next day was glorious but we had to leave. Oh if we had only had another day. Even if the weather didn't clear up there were so many places to hike and see that we needed to stay another day. "The view at the top of Mount Titlus"
The group was very interesting and diverse. We came together nicely as a group. Maisie was delightful and funny. The itinerary covered a vast amount of geography and gave a full spectrum view of Switzerland. I feel it needed more time in certain areas and less time in others. "My favorite wow was stumbling onto a Ricola garden while hiking toward the Matternhorn at Zermot. It was a beautiful and unexpected find. Another "wow" was when we went to Trummelback Falls. Both were during free time and were not part of the tour." This was a great combination of group and independent travel. Our tour leader, Maisie, was excellent. "I learned that "Engelberg" means "Mount Angel" and that the Engelberg monastery is over the the benedictine monastery in Mount Angel Oregon, just 20 miles from our house! Who knew? Small world." This was our eighth Rick Steves trip and was somewhat disappointing. In the past, many more included activities were part of the tour. On this tour, however, the few activities that were included either were unnecessary or gave us far too little time to experience. The tour was rushed, included several cities that could have been shortened in time, or gave us far too little time in the Alps, which was the highlight of the trip. "My Wow moment was an experience we had that was not included in the tour, a hike through Trumellbach Falls, which should really be included. We were actually inside the Falls and were able to experience the rushing waters. This took place in Murren. We also enjoyed walking through a glacier cave on Mt. Engleberg." never wanted a tour but best of Switzerland looked stunning- it was!Trip well done/easy. Rick get's it[INVALID] small group[INVALID] free time[INVALID] not rushed/pushed-awesome guide. beautiful country. tour picked the 'best' and We feel we not only saw the best but experienced the best[INVALID]stunning scenery, Cool hotels[INVALID]cool restaurants- delicious food (cheese-chocolate) afternoon in a cheesemaking Alp farm[INVALID] owner yodelled for us! 12th century winery, lake tour for a cooking class- we ate what we cooked! "Sitting on our 5th floor Balcony at stunning view in Lucerne Jaw [INVALID]ping view Schilthorn"
My Switzerland tour was my first trip to Europe and it far exceeded my expectations. We had the most joyous group of travelers led by a knowledgable and humorous guide. The combination of guided experiences and personal exploration time immersed me in the Swiss experience to a depth that makes me feel like I truly know this country. I loved Switzerland and can't wait to plan a trip to go back and ski there! "My favorite Swiss "wow" moment was when I hiked solo, from Trubsee, down to Engelberg. The scenery was surreal as I hiked through meadows and pastures accented by the melodious tune of cowbells. Traipsing along the most beautiful green grass, amidst striking alpine monoliths I found myself in a perpetual state of awe. This was the one experience I hoped to have on this trip and here I was checking a box on my bucket list. My soul fulfilled." This was a whirlwind tour of Switzerland with stops in the mountains, on the lakes and zig zagging across the country. This is the first guided tour I've taken and I wondered if there would be an added value in being part of a tour group. The greatest value was having a knowledgable to ur guide. He added historical background to the places we visited providing context and greater appreciation. I definitely got value from this tour and would recommend it highly. "My favorite place was Murren. I loved the feel of the village and the proximity to such great mountain views. There were lots of walks in the area for all different levels. I can close my eyes and see the mountain tops, the green alps and the trees. The gondola ride up to the mountain top was a highlight and we had great weather so I could see mountain tops all around." I enjoyed the tour very much. There was a nice mix of mountains, lakes, cities and countryside scenery. There were a couple of activities I liked less than others. The hike to the Ruttli(sp?) meadow was a lot of work for what it was. Wasn't too interested in the Fortress Furrigan (sp?) and the experience at the cheese alp was just way, way too long. Also the walking tour in Bern was too long. It seemed like we were killing time until we could check into our hotel. "The 360 degree gondola ride from Engelberg to Mt. Titlis. Just breathtaking." Switzerland is beautiful. There was always something to do, and if one didn't want to participate, generally he didn't have to. Fabian Rueger was first rate. He is a very good historian/story teller. This information we get from the tour guide and the specific/local guides is the difference between a Rick Steves' tour and a tour on your own. A significant point: On all of our Rick Steves' tours, the contributors (bus driver, specific tour guides and events) all occurred on time. "Murren and the surrounding area. The snow covered Alps are super." Simply outstanding tour. We saw, experienced, enjoyed, and learned so much about Switzerland and its people and history. This was our first Rick Steves' tour and it greatly exceeded our expectations. We are already planning for our next tour with Rick Steves. "Our guide asked the same question, and really, we had at least one "wow" moment each day. Here's my top ones: - Upon departing the Alp cheese farm; being yodeled to across the fields from the farmhouse, pure magic and totally unexpected. - Standing on the Schilthorn deck and trying to absorb the absolutely stunning view completely surrounding the deck. We missed the group hike that afternoon because we had so much fun on the Schilthorn. The James Bond exhibit was also a total blast." This is my third Rick Steves tour (including Scotland), views from the top of the Alps, flower filled villages, and cities selling luxury were wonderful, but the pace on some days felt like bootcamp. I had some difficulty with altitude sickness. The hotels were perfectly located, the food is chocolate, cheese and croissants - all delicious, and there are mountaintops and castles to explore. Private boat ride to restaurant in Lugano was memorable, as was rotating restaurant at Schilthorn. "The view from the Schilthorn restaurant (the Eiger! the air!) and the Matterhorn will always be with me. The flowers in the alpine villages and on market day, the chocolate, the cheese, the efficiency of the Swiss - they are all "wow" moments. I am from Florida, so the mountain views from the cable cars were a real treat." Awesome! Better than I could have imagined. I went with my two grown daughters and had the time of my life. I love Switzerland with its natural beauty, how it's so clean and would go back to spend more time in the mountains and lakes. Our tour guide Fabulous Fabian was also awesome, a great story teller, such a knowledgeable historian, fun, so considerate with my dietary needs supplied at each communal dinner, gave us chocolate sometimes and kept us completely happy. He was a great leader. "High in the mountains Murren. Arrived late in the day via gondolas to rain, thunder and lightning. Exciting, a little scary, and spectacular." Overall the tour was wonderful! I feel we experienced all that Switzerland had to offer from the chocolates tasting to the chees alpine; from the wine tasting to the risotto cooking class! We got to experience all the cultural influences from German to Italian to French! We got HIGH on a mountain and low around beautiful lakes! Big cities and small villages were included! We were blessed with great weather so we're able to experience all the sites and sounds in all their glory! Loved it! "2 WOW moments for me were the chalet town of Murren ! Loved the view and the Schilthorn! The cheese alp was my second! To experience that part of Swiss culture was amazing! And when Teresa began to yodel as we made our way back to the bus, it brought tears to my eyes!" The scenery in Switzerland was all that I hoped it would be. We were very fortunate to have excellent weather for sightseeing [INVALID] only two quick thunderstorms (once while shopping and once while eating dinner) that served to clear the muggy air. Our fellow tour members were a very congenial group, and we have been able to share pictures among us. The pace of the walking portions was too rapid and there were many times that my wife and I were out of range for the orange radios. "Seeing the Matterhorn, the Eiger, the Monc, and the Jungfrau in all their glory." This was a wonderful tour of Switzerland and I highly recommend it. This was my first Rick Steve's tour and after going on this tour, I would definitely go on another Rick Steve's tour. I feel like we got to see a lot of interesting things and learn a lot about Swiss history and culture. And I like that we also had a couple of free days to explore a couple of the towns on our own. We definitely saw some hidden treasures that I think we would have missed if we had just gone on our own. "My favorite "wow" moment was when we took the cable cars up all the way to the small town of Murren, checked into our hotel and then saw the view from our room. It was an amazing view despite the rain and thunder. It felt incredible to be staying on a mountain at 5300 ft elevation and to be getting that amazing view of the mountains, the valley and the trees." We met lifelong friends in our cohesive group. The activity level was good, though I added in a few workouts on my own. The sequence of mountain villages and cities was optimal as each was better/more unique than the one before. I loved every stop except the military cave. I believe an option to sit at the little cafe where the bus parked would have been much better for me. It was difficult to breathe and a bit claustrophobic and I had little interest in it. My husband loved it. "The time spent at the top of the Schilthorn was my wow 3 hours. I almost didn't go as I thought we were only going for breakfast! That's all that was mentioned. Since I don't eat white bread, pastries or meat, that didn't hold much appeal. All of the activities and wow factors should have been presented. I'd have really felt amiss had I opted out! The breakfast was the best we had and the revolving view...wow!!! We did everything, the thrill walk, playing the alphorn, James Bond." After feeling somewhat lost in Zurich on Sunday and somewhat lost in Lucern prior to our meet and greet at 5 PM . My friend and I were afraid that the rest of the trip was not going to be so good. Neither of us were disappointed. This trip was spectacular !!! I loved the tour. We saw many amazing sights and I was very impressed at how well organized everything was. It was actually relaxing even though we were traveling to so many different places. "Murren stood out as the highlight of the trip. Just spectacular scenery, great weather and such a quaint area. Loved it." Very positive experience....Switzerland is a beautiful country. The tour itinerary was well designed,and the guides/leaders very good at their jobs. What made our tour experience especially gratifying was the mix of wonderful people we traveled with. We had been to Europe many times as independent travelers and very few times in a group tour. I was apprehensive about having political discussions which have made our country so divided....this never came up. "Easily, the views from Schilthorn!" Wonderful tour, our tour guides Martin and Nygil were great. "The stop at Murren with the amazing view of the Swiss Alps." "Coming down the gondola from Mt Titlis, hiking around Lake Truebsee and then jumping into the lake when the sun came out. Hiking up all the stairs from Lake Lugano to the top of Mt Bre was also so cool." Our tour had the perfect recipe: knowledgeable, friendly tour guides, pleasant tour mates and wonderful places to visit. Additionally, our bus driver, Marion, was outstanding - a great driver who liked people. "The ubiquitous fountains throughout Switzerland; where cool delicious spring water flowed. I loved filling my water bottle throughout the day at these fountains." I had very high expectations before the trip - this tour, tour guide (Martin) and tour assistant (Nygil) exceeded my expectations! I very much enjoyed the other participants as well. I liked having a "buddy" and I really enjoyed the "buddy introductions". "There were 3 "wow" moments for me with a "runner-up wow moment": 1. The evening in Lugano when we went to the Grotto San Rocco by boat and made risotto - the setting, the food, the experience from start to finish - exquisite! 2. Visiting the cheese making farm - awesome! 3. Visiting the Domaine du Daley and tasting their wines - also awesome! Runner-up wow moment:The tour of Bern and the question and answer session (at the brewery) with guide Miriam. She was amazing and I learned so much!" At first, I was a little surprised by the size of the group (over 24 of us. I'm glad we had two tour guides to manage it. We had a wonderful time. Both guides were knowledgeable, professional, fun, and helpful. We rode every mode of transportation available. It was awesome! This is my second RS tour and I'm feeling more and more confident as a European visitor. The hotels were comfortable, clean, and the breakfasts delicious. "My husband found me crying as I sat on the bench facing the valley during our visit to the Alpine dairy. We arrived and the Alp horn was played for us. We watched as cheese was being made. We met the cows and goats that provided the milk. We tasted all types of cheese, meats and breads. We visited the cellar where the cheeses were kept. I wept. The was so taken by the beauty of the location. The pure simplicity of life there and experience I was blessed with...it touched my heart." When I was raised in the '50s, I was told and lectured that the USA was the greatest country on all social, political, economic,and physical fronts. Umm Switzerland is sheer wonderment and has stood the test of time in a better way. "I'm staring at this huge range of mountain peaks in Murren after a week of traversing throughout the central Alps region and I'm told the Swiss built a rail tunnel through that same range at 10,000 feet." Wonderful tour, even better than I expected. Martin is a great tour guide, very friendly and helpful. As Martin grew up in Switzerland his knowledge of the country was excellent. Nygil was a valuable tour assistant especially with his knowledge of wines and coffee! We had a fun group... no grumbles. "Muren/Gimmelwald Would have loved to spend at least two full days there." This was only our second tour but we enjoyed it. We were not let down about the Rick Steves tour experience from the our "Best of Paris" tour last year. We enjoy the free time and the planned tours and dinners. "Too many to say honestly...the beauty of Switzerland is close to what I remember in '85. A wonderful country. But my 'wow' moment for me was sitting in a church listening to monks sing (whom I couldn't see) during a ceremony. It just took me to a place I don't frequent often." This tour was amazing. I am one who prefers the country-side rather than cities, but there was a great blend of both. The scenery was beautiful, so many mountains, valleys, lakes and rivers. And the chocolate tasting, cheese tasting and wine tasting were great too! "I have to say there were many "wow" moments. Starting with cruising on Lake Luzern to the Rütli meadow and then on to Fortress Fürigen. The cable car ride to Mount Titlis and the fantastic view from the top. The perfect weather in Zermatt and the view of the Matterhorn. Eating breakfast at the top of the Schilthorn and watching the scenery go by. And definitely taking in the Trümmelbach falls, with the water thundering down and providing a refreshing cool-off on a warm afternoon." The tour was amazing, the sights were wonderful, and the experience was one I will always remember. "Seeing the Matterhorn was an unexpected joy. We were told many times that due to cloud cover, there was a good chance we would not be able to see it, but low and behold, it was a clear, sunny day. The matterhorn was in clear view, and the view (and experience) was outstanding." Well planned, guided, run with Swiss efficiency, but all the while fun and full of fascination. "By the way that this tour was designed, it was apparent that much planning, sequencing, and coordination was involved. It Worked !! The most unique moments were: - the cheese making and tasting experience..including balcony yodeling by the farmer's wife. - the risotto making, just plain fun and very scenic. - breakfast in a revolving restaurant on Mt.Schilthorn - driving into Montreux, having Fabian explaining the lyrics to "Smoke on the Water"." I had no idea what to expect on this tour of Switzerland. Why go to Switzerland...what's there to do? This trip exceeded my expectations. Not only was the scenery spectacular, but the activities planned for us were so very memorable. I will forever remember making risotto, and eating lakeside, watching cheese being made in the mountains, wine and chocolate tasting. These personal activities were what made the trip fabulously memorable for me. "There were so many "wow" moments that I didn't realize that word was such a predominate part of my vocabulary. The majestic mountains, the mirrored lakes, sage colored rivers, roaring waterfalls, little countryside villages, brought "wow" to my lips over and over again." Was absolutely amazing. I will definitely remember this trip for a long time and will recommend more Rick Steves tours to people in the future. "Engelberg and the Latterbrunnen valley"
If breathtaking views, bountiful hiking opportunities, delicious cheese and breathing fresh mountain air is your jam then this tour is for you! My family and I had a wonderful experience and a trip we will never forget! "Hiking in the Lauterbrunnen Valley and the Oberland. Absolutely stunning. I also adored our cooking class overlooking Lake Lugano!" This is our second Rick Steves tour, and the first one where we travel from place to place. Everything was well organized. Our tour guide and bus driver were great. We had pretty high expectations going in, and we were not disappointed. I wouldn't have minded extra time in Engleberg or Murren, and less time in Lugano and Lausanne, but that's because I prefer small towns and countryside vs. cities. Overall, the itinerary was excellent, and the entire trip was truly memorable. "Hiking the North Face Trail during our stay in Murren. The views and setting were phenomenal. I stopped one time to take in the views and thought to myself, "this is heaven"." Although it was a "sampler" tour it was rich with sights, sounds, information, and of course tastes. Our tour guide Martin was exceptionally knowledgeable about Switzerland which helped enrich the overall appreciation I gained for Switzerland. The interaction was great with the other travelers and the pace was variable. There was structure to the tour but also enough independent time to feel free to explore. "I loved the really small villages and the visit to the dairy to see cheese being made. That really connected me to the roots of the country." Incredible beauty and hiking. Would have liked to know there is Lyme disease there; I would have gotten treated pants to wear when hiking. (Got a tick bite-so far, so good.) Martin was a wonderful guide-enjoyed learning so many aspects of Switzerland. Group was great; found 2 other couples that we clicked with. Appreciated how Martin helped the group connect. Hotels were better than expected. "So many! It's just a gorgeous country." I had a fantastic time. Martin and Karin were professional, knowledgeable, helpful, and fun. The hotels were in great locations and very nice[INVALID]much nicer than I usually stay in. The breakfasts had enough choice for everyone and the beds were comfortable. The activities were great[INVALID]a good mix of experiences and out doors. The people were fantastic. I loved it all!! "Paragliding in Mürren! But I loved so many things--the chocolate tasting, the dinners, the Alps! I loved going to the tops of the mountains." The tour lived up to all my expectations. Martin was excellent as our tour guide preparing us for each location as we progressed through the tour. He did this very well, and I found this to be very helpful. Since the tour was larger than usual I think it was helpful for us all to have the support of an additional guide. The pacing of the tour was a balanced well with tours and free time. I enjoyed the variety. The only suggestion I have is more veggies for group dinners. "I had a few. Lugano was my favorite city. The hiking in the mountains. The Cheese family farm experience. The Bunker most historically interesting. winery I just had fun! But the team building cooking class in Lugano made us all feel at home with each other and set the tone for the tour. We had a really engaging group that made the trip more memorable." Our first Rick Steves tour as well are our first trip to Europe. A great trip experience!!!! Great mix of guided tour and free-time. Reallly helped having a walking tour of each town before being encouraged to explore on our own. Martin was an outstanding guide - really nice having a guide who was a native. Loved learning about Siwiss history and governing - something we wouldn't have learned on our own. "The trip to Murren - first experiencing the Lauterbrunnen Valley, then on up the mountain via gondola. Wonderful little town with such wonderful scenery and so many hiking opportunities." We had a wonderful time. We were able to see so much more than anything we could have done on our own. It was so gracious, caring of everyone, ensuring needs were met and people were included. They were able to create a welcoming atmosphere for everyone. We felt like we had lots of choices, and a fabulous array of experiences. "The dinner where we competed with making risotto. Fun as a group, a little competition, a fabulous sunset on the lake, excellent food, great company." We had a great tour group and tour guide. Our coach driver, Phillipe, was very professional and added to the camaraderie. However, the tour bus, was not as good as the HeidleBloom coach in my opinion. The AC could not cool the bus adequately. The hotels were nice, the rooms were nice, but again the AC was inadequate in the towns of Lucerne, Lugano and Bern. Activity level seemed to be higher than what was described for the tour. "My favorite WOW moment was our Polenta cooking lesson on Lake Lugano, our dinner of polenta with our braised beef and experiencing the charm of our hostess and tasting the Ticino white wine from the Merlot grapes." Appreciate the overall pace and combined methods of travel; bus, boat and walks. Love the two night stays. Much more relaxing to not have to pack each day. Really like the personal time to explore and hike after the shorter "orientation" walks. I feel we experienced the best of the whole country. It was lots of fun to have the "hands on experience" of risotto preparation, chocolate production and cheese making. Delightful to have such interaction with the local experts. "The beautiful vistas while hiking in the high meadows. Getting to see the Matterhorn." The product was just as presented. This is to contrast with offerings that are often well less than advertised. I found the organization to be very good with all pleasant surprises rather than some unpleasant ones. The type of tour appeals to a certain set of the travelling public and a very appealing one to me. The pace was generally good. The accommodations largely quite satisfactory. "It was the unexpected "extras" that pleased me so much: the risotto cooking and the cheese making." We loved it. It had a good balance of cities and country. Martin and Karen appropriately provided great information at the right time. Switzerland is a beautiful country and the tour provided it at its best in a balanced approach. There was also a nice combination of great scheduled events at the appropriate time and some free time to do things on an individual preference. "I enjoyed when surprisingly, the tour's boat drove in a great area in Lugano and the tour was greeted to appetizers and wine with very nice hosts. Then we all got together in groups and cooked risotto. Also, a close runner up was visiting Claus on his gorgeous cheese farm and having wine and cheese after witnessing how the cheese was made. At that farm, it was wonderful to hear the Alpine Horn played in such a beautiful setting as the music echoed off the mountains." It was a fabulous tour! It's great having all the details handled so all we needed to do is show up. We really enjoy having an even mix of planned tours and free time to do what we want. "There were several 'wow' moments but the natural beauty of the Berner Oberland tops my list." 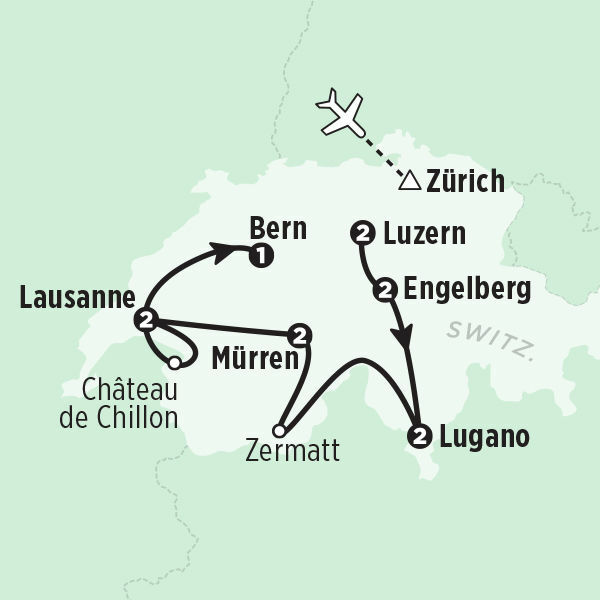 A great itinerary, in-depth experiences in each of the stops and unique areas of Switzerland. Everyone (including fellow tour participants) was so nice, relaxed, happy to help. Loved the free time in-between the intense tours so that we could do what we wanted and got great suggestions from our guides. Local transport travel passes were great. "Tie between summit of Mount Titlis and the optional breakfast at top of Schilthorn, breathtaking views." I had high expectations for this tour and I was not disappointed ! The tour not only delivered on spectacular scenery (which I was totally expecting) but also provided in-depth information on the history and culture of a very interesting country thanks to an outstanding guide (Donald) and his assistant (Martin). "The Jungfrau Region had to be my WOW moment. The mountains were surreal and spectacular...the view from our hotel balcony in Mürren took your breath away. I expected beautiful mountains but this was beyond that." Donald and Martin led us through 12 outstanding days of stunningly beautiful Switzerland. The diversity of the German, Italian and French speaking sections of Switzerland was unexpected but interesting. Weather was favorable for all "must see" vistas, even the Matterhorn. Good pace with plenty of free time. "Riding the Schilthornbahn cable car through the clouds to the Schilthorn peak for breakfast at Piz Gloria revolving restaurant. Expected James Bond to join us for a quick ski run down the mountain." Quite pleased. The tour was just what it was advertised to be - a great overview of Switzerland. "Gosh. Hard to say. Probably the gorgeous mountain scenery in many places. Maybe Berner Oberland views??" It was a classic Rick Steves tour, nice people, great tour leader, saw the important sites but more important, became intimately aware of the culture and learned so much more than "drive by" tours could accomplish. Great choice of cities and places to visit. Comfortable hotels, good meals, exceptional tour leader in Donald. Martin added a nice touch of Swiss nationalism and extra layer of safety and person to answer questions and direct us on our "free" time. "Sitting in our hotel (Alpenruh) in Murren looking out at the Jungfrau." great combination of location, arrangement of group time and individual time. Martin is an excellent, considerate, knowledgeable tour guide. "scenery sites, location of some hotels, Murren"
The tour was well organized with a great balance of planned meals and activities and free time. And the scenery in Switzerland is extraordinary[INVALID]whether it was cloudy or sunny! The hotels we stayed in were fabulous, very convenient, comfortable and clean. This was our second Rick Steves tour and both tour groups were filled with a wonderful group of travelers. "There were several WOW moments, but the top of the list was coming home from dinner in Murren on my husband's birthday and seeing a rainbow over the Eichorn and Jungfrau peaks. Murren in general is just Wow! Wow! Wow! And it was his birthday! Another WOW moment was going up to Pilatus in Lucerne on a beautiful sunny day and hearing the sounds of church bells and cow bells in the distance. Another extraordinary moment was the alp dairy farm where we heard beautiful music played on an alp horn." The tour had very good coverage of the different areas of the country. The knowledge imparted of the history and culture was very enlightening. The cities were interesting, but obviously one comes to Switzerland for the scenery and the mountain culture. And it was awesome! The compactness of the country also made it easy to visit the various sites without several long bus rides. "Visiting the 007 facility at the top of the Schilthorn was terrific. Fortunately, we had good weather for at least half the day and the views were spectacular!" This was our first Rick Steve's tour and I was very pleased. I really appreciated the cheese farm, the risotto making class/dinner, the visit to Rutli and the Swiss Fortress. These are all things that I would not have been able to realistically do as a solo traveler. "The view from the top of San Salvatore in Lugano. The weather was perfectly clear and we had no expectations on what was to be seen at the top. The view was incredible and made me fall in love with the Italian part of Switzerland." We had a Wonderful tour with Fabian in Switzerland!!! He was an Extraordinary Guide!!! We had Such A Great Time!! "I Think Our Whole Tour of Switzerland Was A Wow!!! We Loved It!!! Every Where We Went!!!" This was the best tour I have taken in Europe. The weather was sunny and warm, the accommodations and transportation very comfortable, the food excellent, the scenery outstanding and so much more. The group size worked well and it was nice to make friends with others from around the states and Australia. "There were many "wow" moments, but I guess I would have to say that actually seeing the Matterhorn in all its glory with blue sky in the background was a "wow" plus moment. All the mountain destinations were beautiful and I took many photos to share with my family. The fields and valleys were green and pristine. Switzerland is the cleanest country I have visited in Europe and I would highly recommend is a European destination to all my friends." We had a very good group of diverse travelers that came together and had a good time touring new sites. Switzerland was just wonderful, although a bit more expensive than we planned. Our tour guide, Fabian, was just the best, His total goal was to help the group make this a tour of a lifetime. "A "wow" moment was probably the evening that our Lake Lugano tour ended at Grotto San Rocco. We had a lesson in cooking risotto. The risotto turned out to be relatively easy to cook and was delicious. Everyone got to participate in 5-6 person groups. We all had fun "competing" to see which group made the best risotto. While there was no official winner, our group had the best risotto, of course. It was just a wonderful evening. A little good local wine added to the festivities." Well planned and enjoyed the wonderful variety of destinations. Nice to leave the planning to the experts! Group size of 28 made it easy to get around and also become familiar with everyone. Good balance of group time and on your own time. Well paced, fun activities, GREAT TOUR GUIDE (Fabian). "Being able to see the rarely seen Matterhorn, walking around the Ice Lake in Trubsee post Mt. Titlis excursion, as well as the Risotto Cooking class - so fun"
A wonderful experience with a great guide and fun tour group members in a beautiful country. Nicely paced between all of the lake and mountain towns. "There were so many on this trip- Alpine Cheese Making Demonstration near Bern-when our host and cheesemaker began to yodel all of her cows came running. All the strolls along the beautiful lakes All the cable and funicular rides at Mount Titlis, Schilthorn and the Matterhorn Boat ride in Lausanne around the lake and the stop at the winery Singing Smoke on the Water on the Bus and learning the history of the song-who knew!! Boat ride and cooking class and then dinner in Lugano"
I loved this tour.I believe I got a very good look at Switzerland. The people on the tour where great. "The wonderful view of the Materhorn." The philosophy of Rick Steve's travel was apparent on our Swiss tour. I found it to be a very good fully guided tour, with the inclusion of some day to day experiences which would have not been possible without a guide. i.e. the cheese making day on the farm including yodelling. I can still hear the cow bell jingling. The overall organisation, tour leader guidance etc. was very good. "Murren was a stand out, being located two gondolier rides from the bus and then the breakfast experience at the Shilthorne was outstanding mainly due to the view." We enjoyed this tour. Our favorite part was in the mountains of the Alps (Mt. Pilatus - on our own before tour), Murren (Schilthorn piz Gloria) and Titlus. The evening at the cooking class was fantastic! Great fun, wine and food with a beautiful view and super nice hosts. The best addition is the whisper quite system with ear piece. Made it SO much easier to hear the guide - even when not standing very near. Love this! All tours need this! "Seeing the Matterhorn up close! Having breakfast 10,000 feet up at the Schilthorn, hiking in the JungFrau and staying in/walking around Murren. Also loved the chocolate making/class and cooking class. Super fun events. Can't say enough about the awesome food, drinks, service and views at the cooking class. The wine tasting was wonderful!" This was our second tour lead by our Guide Donald. He is a very organized person is very passionate about his role. As in past RS tours the education value is an important reason we sign up for more tours. In my mind this is what sets RS tours apart from other choices including traveling on your own even with the RS guidebook. We suggested to Donald that we needed more time after first arriving in a city - Donald made changes. "The wow moment was seeing the Matterhorn. We were lucky to have almost a total clear view of the Matterhorn." This was our first Rick Steve's tour and was amazing. Each day was perfectly balanced with sights and activities and guided tours. Our tour guide Donald set the bar so high that it will be hard for others to beat. We will definitely take more tours with Rick Steve's. Hotels, food, tour bus, and guides (town and site experts) were all first class. Also a great balance of personal time. Thank you for a wonderful experience. "They were all WOW, but the day spent in Engelberg was the best. Breath taking views of mountains, hiking down from Trubsee, gondola rides, and valleys so beautiful it is hard to imagine. Oh ya, the alps dairy farm for cheese production was pretty great too." "Several [INVALID] Lugano (a gorgeous city and lake), the Matterhorn (you have to see it), and the Alps (everywhere, the Alps)." This trip was a great balance of "handholding" with instruction on how to navigate our way through Switzerland and free time to do as we pleased with all that we learned. Our tour director, Donald White, was excellent[INVALID]well organized, good sense of humor, extremely patient and knowledgeable...The group dinners were excellent, the city tours well-done, the exciting trips up mountains[INVALID]exhilarating and the fellow travelers were lovely people! Our bus driver, Irene was exceptionally cheerful ! "So many WOWs...hard to pick one...each mountaintop, each hike, each group dinner, each hotel, the cheese farm, the risotto making...the chocolate tasting, the vineyard...learning how to navigate mass transit in a foreign country with confidence!" This was my first tour ever and it far exceeded my expectations. Switzerland is amazing! I loved all the places we stayed, the tour group was great and Donald was incredible. The only things I would change: our stop in Gruyere and a much shorter city tour of Bern. "I can't come up with one favorite. I had many. I loved the boat trip where we ended at a restaurant and made risotto. Going up to the mountain tops was a thrill. Our visit to the cheese making family was sweet. My favorite destination was Murren. Hiking in Murren and seeing the waterfalls in the mountain, amazing. Breakfast atop a mountain in a revolving restaurant, incredible." This was our first Rick Steves Tour so it was meant to be somewhat of an experiment - Would we like going with a tour group? Was it well-organized? Did we get to see what we wanted to see? Were we spending more time on a bus than seeing what there was to offer? Was there a good balance on free time v. scheduled time? On all fronts it exceeded our expectations! Overall, the trip was spectacular and memorable! "I would have to say Murren was my favorite location. To that point, we kept saying "can this get any better or be any more beautiful?" Murres had a great mix of spectacular views, hiking, things to do and a balance of group v. personal time. Other favorites: cooking class, cheese making cottage." Fabulous way to see so much of Switzerland with Donald as our guide, Irene as our driver and a wonderful group of travelers. The activity variety made each day very different and fun. Cruises, trains, gondolas, trams, hikes/walks, cliff walks, cooking class, alp horn concert accompanied by cow bells, breakfasts, dinners, chocolate, cheese, beer, wine and amazing views from the tops of the alps to the valley and everywhere between. "WOW! Murren was how I imagined Switzerland. The side trip to Shilthorn breakfast and cliff walk was amazing. Hated to leave the beautiful waterfall view from my hotel." Excellent tour, the major sites with more time for more exploration on our own. Very well planned, and well timed. Walking was easy. Beautiful places, all the hotel locations are excellent. Weather was perfect !! Second half of May, in the 60's to 70's F, and the 40s on the mountains, a lot of the snow had diminished. We flew in via Zurich, so got to see it again too. And Switzerland is like 4 different countries, nice to see each. "View from Murrien Hotel! And that valley! View from Luzern Hotel ! All the lake cruises The Bunker, Mt Titlis, the Schlitterhorn, Zermatt, and the rest of the cities! and the Lakes. (I took a lot of photos!)" What a great blend of customer service, historical & cultural guidance and free time to play our way! We so appreciated "pushing the easy button" on the planning and 4 languages. It was very nice to meet other American travelers who were very much like us and yet not be in cramped quarters with them the whole 12 days. We loved all the towns chosen and all but one hotel. We loved all the activities pre-booked for us as well. We're spreading the word, it was GREAT! "On Lake Lugano, the boat ride to our cooking class dinner at sunset was a sublime evening! After all the expected snow and Alp hiking, churches & museums, this warm evening outdoor dinner party was unexpected and refreshing. But hey, those stunning views of the Alps had us singing Sound of Music songs quite heartily, too! And the cheese farm visit! That was very special, too!!!" I loved traveling in Switzerland for many reasons including the obvious outstanding scenery, but other things stand as well. Experiencing THREE cultural areas, all clean and advanced. I like alternating between cities and small villages. Each day seemed better than the last from awesome mountain experiences to super charming villages (Engelberg and Murren were favorites). "Too many! Being on the top of Mt. Titlis The cheese farm...OMG, it was so charming being amid the cows! The gondola ride(s) to Murren and Mt. Schilthorn. Breakfast there was great. Walking to Gimmelwald ..exactly like RS says! The winery....and getting back up the hill (at my age)!" Fabian fun and very knowledgeable, did great job of "team bonding" and provided a perfect pace for the trip. "two wow moments! Taking two gondolas to our hotel halfway up a mountain and crossing Lake Lugano for a cooking lesson in a delightful restaurant on the lake." This was my sixth Rick Steves tour. I have enjoyed all of them. The only reason I did not rate this tour as outstanding was the meal [INVALID]ion. The group of people on this tour was my favorite of all the tours. My fellow travelers and Fabian combined to make this a wonderful tour. "Although I had been to Murren three years ago as part of the GAS tour, Murren was once again my WOW moment. The scenery is just so spectacular. It also helped that we had beautiful, warm, sunny weather at Murren. Before the trip began, I thought that seeing the Matterhorn would be a WOW moment. Unfortunately, the weather did not cooperate. It was rainy and foggy. The Matterhorn was not visible during our 3 hour stay in Zermatt." My 7th rick steves tour, and once again, our tour guide, Fabian, was very knowledgeable about both the history and contemporary life of the country. Our group was fabulous, good travelers with some common core interests, and seriously, how could Switzerland itself be anything but amazing. "Arriving in Murren and looking out the window to see the Eiger, the Mönch, and the YungFrau right there. I was on scenery overload from that moment forward I was also surprised by the amount of water and the times we used it for transportation in Switzerland"
The tour was excellent. The guide gave us detailed historical background for each of the areas we visited. Everything was well organized and ran very smoothly. "The countryside of Switzerland is beautiful. The first time I saw green meadows on the mountainsides leading up to the craggy snow covered peaks was definitely a "wow" moment." This was our first Rick Steves tour and we were so happy with it. Our guide, Fabian, couldn't have been better. We loved our group members. All our activities were great and our overall itinerary was full of wonderful and interesting experiences for us. We look forward to going on more Rick Steves tours in our future! "Being high up in the mountains is always my favorite part of a trip. We loved Engelberg and Murren. and the hikes we took there. Another favorite activity was going to the Grotto on Lake Lugano and making Risotto." This was our fifth tour with your organization. There are so many things to love about this tour. Fabian was fantastic. The tour stops and hotels locations were excellent. The guided tours were very informative. I really enjoyed this whole tour. "My wow moment was breakfast at Schilthorn revolving restaurant." Wonderful tour of Switzerland mountains plus delicious cheese & chocolate! Loved the visits to learn about Swiss cheese making, chocolate tasting & the winery tour with tasting. "Many for me! Boat ride on beautiful Lake Lugano & then a fun Risotto cooking class for our group dinner at Grotto San Rocco! Delicious appetizers too! Loved our stay in Murren, with fabulous mountain views from our hotel balcony, breakfast at the top of Schilthorn peak & great walking trails!" In general, the tour was very well organized; the tour guide was very personable, knowledgable, and skilled. The group members were very cooperative and got along well with each other. The places we were taken to visit were unique and amazing. "The beautiful scenery of mountains, lakes, rivers, streams, and waterfalls." This trip to Switzerland was our best Rick Steves' tour ever. The sights and cities that we visited were truly amazing. I really enjoyed all the members of our tour group. They were a good blend of friendly couples, comic characters, and very interesting individuals. As for our guide Fab-ian, he was fab-ulous! 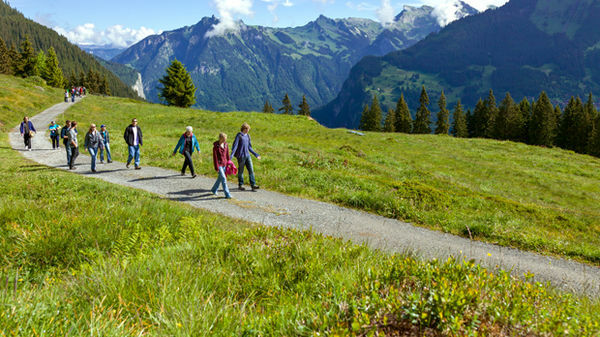 "Without a doubt, it was a family hike that my husband and I took with our two adult children during our stay in Murren. We hiked to Almenhubbel. The scenery from that altitude is amazing ... beautiful mountains, spring green meadows, and even soaring paragliders. The most spectacular thing along the way was the thousands of crocuses in bloom where the snow had recently melted away!" The format of the tour is great. About half of the time is organized by the Rick Steves group and the other half is on our own. The guide is available for suggestions and support when needed. We saw so many beautiful sights, learned quite a bit, and had delicious meals. "It is hard to narrow it down to one moment because there were so many but ... Sitting on the hotel balcony in Murren at sunrise. I could see the beautiful, snowcapped Eiger, Monch, and Jungfrau mountains clearly but the only sounds I heard were a gurgling waterfall and a lone cow mooooooing. That is what will come to mind first when I think of Switzerland." This was our 8th Rick Steves tour and it was one of the best. Yorick was a great guide. He ranks in my top 3 with Colin in Greece and Tomaso in Sicily. He is funny, knowledgeable and unflappable. The extras he added made the tour great. "The walk through the Aare river gorge was amazing. Who else but the Swiss would see a beautiful gorge and decide to build a walkway through it? And Mount Titlis was beautiful and walking around the lake was fun." The tour was the perfect combination of touring and free time to enjoy the amazing scenery and cities of Switzerland. We really appreciated Yorick's commentary on the social, political, and physical forces that shaped Switzerland's history and landscape. "Do I have to pick just one?! Hiking at Mt. Titlis and around Lake Lugano, wine tasting in Epesses, seeing the Matterhorn come out from behind the clouds, our first glimpse of the Lauterbrunnen Valley, getting to see the cows come through the town of Engelberg, learning about cheese making, and walking the North FaceTrail in Mürren were definite highlights." An absolutely well done tour in all aspects. Interesting, informative, and educational. Areas we visited were off the beaten path, uncrowded and beautiful. Just the way we had hoped it would be. Our guide was so great that we wished he would not stop sharing his knowledge, but of course he deserved a break now and then too......:) Everything was well organized and planned so there was never a lag in the exciting itinerary. It was a fantastic trip, we will cherish the experience for years. "Seeing the Swiss Alps in all of their glory. The Matterhorn appearing out of the clouds as if by magic as we sat on the deck of a restaurant having a glass of wine with other trip members. The Eiger, and Jungfrau with the moon rising above them in the mist the evening we arrived in Murren. The cows bells quietly ringing in the evening, adding to the beauty of the moment. A memory that will not be erased for me. Peace of a lovely mountain hideaway." Wonderful tour, great cities, secure and clean! Yorick was very knowledgable and helpful, enjoyed this experience! "The Alps, seeing the Matterhorn and the Mount Titlis." Excellent itinerary -- felt we saw a good sampling of, and some of the best of Switzerland. Our guide was uber knowledgeable and expressed similar appreciation for and interests in the outdoor activities and the beautiful landscapes that are Switzerland --- made for companionable and informed travels! "Murren, walking out onto our balcony, clouds dispersing to reveal the snow capped Alps and an almost full moon! Our guide, Yorick, was on his balcony next door, as much in awe --- and, he's been there, done that many times!" First of all, Yorick was an outstanding guide. Flexible, attentive, and always cheerful while helping others obtain train tickets or otherwise being accessible. His knowledge of the areas was remarkable and he was a pleasure to be chosen as our guide. "Of course it was those mountains!" "So many but both Engleberg and Murren,hikes to the views!" The tour was well-organized and showcased the majesty of Switzerland. I was overwhelmed with the natural beauty, cleanliness, friendliness, and safety of this country. Our group was composed of gregarious, professional folks, and we quickly found travel buddies who were willing to share a bottle of wine. Yorick, our guide, set the stage for our adventure. "Experiencing Mt. Titlis; the Luzern hotel view of the Chapel Bridge; priceless sites from our balcony in Murren; being in Murren. Weather prevented the Jungfrau experience or visit to the Gruyere dairy farm, [altho we appreciated the alternative efforts.] The river gorge was amazing- pls keep in the tour. The wine tasting at Chateau Chillon was a great tour conclusion. And- cogwheels, funiculars, gondolas, trains, trams, paddlewheel boat, suspension bridge..."
My wife Casey and I enjoyed the entire tour. However getting there, Zurich Air Port to train for Lucerne was hectic. A typed page of directions and a sketched map of the interior of the buildings with general directions might be worthy of consideration. In a nutshell, this was the best vacation my wife & I have ever taken. Switzerland is wonderful in every way and the Rick Steves' aspect made it even better. Loved it and have already recommended the trip to many friends. "The first day in Luzerne enjoying a peaceful lunch by the lake. Couldn't believe I was there enjoying that beauty. Also, hiking the north loop at Murren in a lovely mist in the countryside. A hike along the far shore at Lake Lugano was also a surprise wow moment. Sorry, I can't pick just one!" We we were taken to very interesting places. Yorrick took us to places that were not listed and that made them all the more interesting. The local guides are great. They give you more information than the average person would find by reading. Our bus driver Hans was exceptional. "When we walked from Murren to Grimelwald. I felt like I was in a snow globe without the snow"
The tour provided a great overview of the various environments in Switzerland. The pace of the tour was challenging so as to fit in as much as possible.We had a fun group and we appreciated traveling with others who had very diverse backgrounds.The bus driver Hans was great and was a Swiss native who helped us to enjoy the country.Very happy overall. "Hiking down Mount Titlis to Engelberg was unforgettable." My expectations were high and this tour definitely exceeded them. The itinerary was great, covering all the places I most wanted to see in Switzerland. I loved having two nights at each hotel and having some time on our own to explore. The size of the group was good and it was very nice to have the big, luxurious coach so we weren't cramped. Overall, it was a fantastic tour! "It's tough to pick just one....the scenery was one "wow" after another! If pressed, I'd have to say seeing the Matterhorn suddenly appear from behind the white fluffy clouds was a thrill. Taking the gondola to our hotel in Murren was really awesome, too." Having traveled in Europe many times on my own, this was my first trip with Rick Steves,not my last !! I loved it! It was a wonderful experience.The entire trip was well thought out,a good mixture of culture and scenery. I met some very friendly, fun loving people, everybody got along with each other , and on occasion was helpful! "For me it was sleeping in Muerren with that outstanding view of the Eiger, Moench and Jungfrau! The trip up to Mt.Titlis and Schilthorn. The Gotthard pass and the numerous lake crossings!I cannot single out one " WOW""
This was our first Rick Steve's tour, and we had some pre trip concerns. These turned out to be non-issues, and we were pleasantly surprised and delighted with the tour--- surpassed our expectations. Great itinerary, hotels, bus, guide-- and pleasant travelling companions. "Hiking at 7000 feet beneath the Jungfrau massive"
I had to read my travel diary to remember all that we did. Was happy I could keep up as I am 75 and not in as good shape as I was when I signed on for the trip. Liked the free time to explore and eat on my own. Had a great group of people. Unless you see Switzerland with your eyes and in the sun you wo't be able to understand the beauty. As a first-time tour participant, it was far better than I expected. I appreciate the effort made to allow for an experience of the country, in this case Switzerland, beyond the normal tourist visit. "Too many "wow" experiences to limit to one favorite. I particularly enjoyed the visit at the cheese-making farm as well as the walking tour and discussion in Bern with Diccon Bewes." Reid was a terrific guide, great hotels, too numerous wow moments to list and superb value! This was another great life experience for me. We had been here 10 years ago and the weather was lousy to say the best. This time it was superb! Going up the Schilthorn and seeing the view was fantastic. We really enjoyed the overall experience and had great weather and fellow travelers! "I cannot actually find a wow moment. The whole tour from beginning to end was fantastic. As a RS tour veteran I think the scenery in general, plus the 3 new calves at the farm were just a memorable experience. Walking along the trail from Wengen while seeing the Eiger, Monch, and Jungfrau will be forever etched in my mind. The group of people we had were the best of 9 tours we have taken. Just a memorable group of folks." Another incredible experience on a Rick Steves tour! The tour was very well organized with fun surprises throughout! "Reid took us up to the top of Mt. Titlis in Engelberg on a crystal clear day! The view was absolutely spectacular. This trip I said too many "wows" to count!" I would rate the tour Outstanding except for a couple of things. One, the size was too large at 28 and only one guide. RS might consider reducing the maximum. Second, I was looking forward to peeking into the Lavaux vineyards for a wine tasting as described in the itinerary. This did not happen. As a substitute we drank wine at Chateau de Chillon, but our host knew nothing about wine, which she announced. "Hiking in the Berner Oberland." This was the tour I was waiting for: a comprehensive tour of Switzerland, the most insanely beautiful country on the planet! Instead of trudging through cathedrals and viewing monuments, we had a glorious experience of the natural wonders of the Alps and the charming cities and towns. Hikes to whet our appetite for beer and sausages; the camaraderie of a wonderful tour group, and a guide that told us just enough to keep us fascinated and engaged. "Other than the magnificent Alps -- I was so touched by our trip to the cheese farm, the welcoming couple who provided us with an intimate local experience of traditional farming and food -- and yodeling! -- which I'd never heard first hand." Great tour, awesome fellow travelers, very informative and enthusiastic guide and great accommodations! "Seeing that the mountains are my "happy place", the gondola to Mt. Titlis and its breathtaking views, a clear sunny day of viewing the Matterhorn and hiking in the Berner Oberland were my "wow" moments." "Top of the mountain breakfast with revolving seats." Switzerland took my breath away!! It was just like everything you'd imagine it to be ...and so much more. My eyeballs were on overload! I couldn't figure out where to look next. I was in awe of God's creation. "Godsmacked". Everything...the bridges, rivers, villages, and MOUNTAINS! All the hotels were in a central location which made our limited alone time do-able. The itinerary was wonderful. Weather was perfect! "EVERYTHING!!! Checking out the constellations in Murren at 3:AM ...the cow parade...the cheeses...the chocolates!!!! Visiting the cheese farm and seeing the newborn calves...hearing the proprietress yodel. Sharing a table with a young lad from Lausanne and making a friend." We visited many places in Switzerland which was interesting .I was very disappointed that there was an additional charge for Schilthorn since this is usually included in Rick Steves tours. A wonderful blend of lakes and mountains. We were blessed with good weather throughout the tour. The occasional rain did not interfere with the enjoyment of the glorious scenery- clear views of the Matterhorn, Schilthorn, Eiger, Monch, Jungfrau and much more. I appreciated the steady leadership of our guide, Reid. The historical background and cultural insights he provided enriched our tour experience. The hotels were very good, especially overlooking the Chapel Bridge in Luzern. "The scene I keep returning to in my mind is when we walked into an open area and saw a full view of the Matterhorn. A view which stayed clear for a long time. We were so fortunate. I also have happy memories of a relaxing, warm afternoon while wine tasting in the Lausanne area. Gondola and tram rides, the Lauterbrunnen Valley, boat rides on beautiful lakes...so many "Wow" moments in Switzerland." I enjoyed the variety of experiences and learning opportunities - from bustling, historic cities to beautiful countryside, Alpine vistas, and relaxing lake cruises. Plus meeting interesting, friendly people (including a gondola operator, Diccon (our Bern guide) and the couple on the cheese farm. Some highlights - the IOC museum, the mountain fortifications, all the gondola rides, visit to monastery in Engelberg with the beautiful carvings, Lion monument. Enjoyed the free transport passes! "Definitely it was the view of the Jungfrau, Eigre, and Monch from the Schilthorn. A perfect sunny day and those glorious peaks! And that breakfast buffet - wow!! Walking tour of Gimmelwald, and buying cheese from an'honor' farm, which we shared at a happy hour. Viewing the torch ceremonies at the IOC. All the glorious views from our hotel windows - the covered bridge, the lake or mountains, seeing the sunrise in Murren." Provided a good overview of country, history and culture. Tour manager was very good in educating group in history and culture and customs. Tour was executed well. Itinerary was well planned and and paced. Accommodations for vegetarian worked out well in Switzerland. We added about 3 weeks onto the trip for hiking in several locations in Switzerland using the RS tour book. The tour book made going on our own very easy and minimized stress. "All the mountain bus routes chosen for this trip provided incredible scenery and pictures." Scenery exceptional with great weather. Tour guide Reid perhaps the most uninvolved guide we have had. Very much "you are adults" take care of yourselves attitude. Should not have left us in Berne to catch an early train before making sure all were accounted for. Perhaps he is jaded and should take a break from guiding tours which seem to be more of an imposition to him. Still had a great experience just seeing the many sites. "The Matterhorn in the am. Also being driven through the great Swiss passws"
This was a great trip to see various areas of Switzerland. It was well organized and the hotels were very comfortable. The bus was spacious and everything was easy to navigate. Switzerland is very beautiful AND very organized. "Murren and seeing the mountains of the Bernese Oberland. The ride up to the Shilthorn (an extra fee) and breakfast at the top of the mountain (included) was spectacular." It was a great balance between guided time and group activities and private time to explore on ones own. Although our weather was always a surprise we still were able to accomplish all that was described on the tour. The days were quite full with a variety of activities and sprinkled with culture and history along with way. It was our first tour and i believe it lived up to the criteria promised in the itinerary. "Having the clouds lift and reveal the Matterhorn in all its glory. The next day was especially beautiful waking to a beautiful sunrise Murren. Then having breakfast on top of Mt Shilthorne offering 360 degree awe inspiring views as we feasted on an amazing breakfast buffet. To climax the day was an spectacular hike in the mountains with the Eiger jungfrau and Monch as our backdrop along with cow bells ringing out the songs of "sound of music". In"
"going up to mount titlis see the view and going over the bridge, ice tunnel. also getting to bern and knowing that the trip was over"
We had a fabulous tour. The guide was superb and our teammates were all great fun. "There was one everyday, but I couldn't help but love our afternoon on the cheese farm. After climbing the mountains in endless switchback we entered a world of picture book beautify, a lovely husband and wife, and a great cheese tasting. I was so impressed with this small family and their desire to produce a quality product, live a life a seemingly anonymity, and show that bigger is not always better. I loved it when she yodeled to us as we left the mountain side. What a day!" What an amazing trip! Maisie was fabulous, the tour group was the greatest. We had great weather for all but one day. Viewing the Matterhorn was a special treat, but spending time at the cheese farm on the hillside with the cowbells was the best. Great cheese, sunny weather, very talented bus driver - nothing could be better. I would highly recommend this tour! "Let me see: the Matterhorn, Murren, breakfast at the top of the Schilthorn, the cheese farm, Lugano - too many WOW moments to limit it to just one." This was our first Rick Steves tour, and it was fantastic! Every aspect of the tour was memorable. Our guide, Maisie was wonderful - knowledgeable, attentive, thoughtful and overall a joy. The tour group was a great collection of people, and we made real connections with our fellow travelers. The sights of Switzerland took our breath away almost every day - especially when we traveled into the mountain areas. The Berner Oberland area was magical! We greatly enjoyed entire experience! "My favorite moment was emerging from the fog while descending over the Gotthard Pass, and seeing the surrounding valley and mountains. It was our first clear view of what waited ahead for us and it really made us all excited for what was to come." Our group, with our wonderful guide Maisie, experienced and saw so many wonderful things! We had a great group of friendly tour members that helped enhance an already wonderful experience. Wish I could scope them all up and go again with this same group. This was our first Rick Steve's tour and hope to do more. "Favorites were the visit on a sunny day to the cheese farm, hearing the cow bells in the valley below, getting to see the Matterhorn, riding the gondolas to the Shilthorn and finding the beautiful view of the Eiger, Monch & Jungfrau and breakfast high up at Piz Gloria." This was our first tour of any kind. We did not give an outstanding rating because at times it seemed a bit unorganized. We did not get the notice about the opening meeting being moved up by one hour. Another couple that had taken other RS tours also did not get the message. Seems like an email or other communication other than a posted note in the lobby would have been used. In addition some of the tour meals were a bit disappointing. "The ability of Joseph our driver was amazing. We would not think he would even attempt some of the rides he took us on. Also the rides up to the high country were thrilling. Even though we did not get perfect weather it did not seem to matter when surrounded by such beauty." We booked this tour because we wanted to visit Murren again and see other parts of Switzerland. It had the perfect balance of scheduled vs. free time. We received a good value for our tour dollars because we saw so many different places, and we didn't spend too much time any one day on the bus. We had a terrific group of tour members and an organized, funny, relaxed, and informative guide in Maisie. With some tweaking, this will be a great tour. "There were several - seeing the Matterhorn on a clear day, breakfast in the rotating restaurant on the Shilthorn with a 360-degree view of the Alps, visiting the local farmer for an introduction to cheese-making, and the drive up the Grimsel Pass (courtesy of our driver, Josef!)." Maisie was a tremendous guide, my fellow travelers were friendly, accommodations were top-notch, and food was good and served with smiling faces. "There were so very many...but heading up the Gotthard Pass we were in the clouds so visibility was either limited (or nonexistent. Josef, our driver (he was superb), suggested that we stop at a different place than usual at the top. What a great decision because as soon as we crested the peak the skies cleared and we could see for miles. "Wow moment..." Then there was the Matterhorn...We saw it!" I enjoyed seeing Switzerland, all it's mountains and lakes. I had a good visit, But due to my age and physical problems, I didn't enjoy it as much as I hoped. But more than I expected. "The ride on Lake Geneva and the visit to the Chateau de Chillon. And of course the vineyard and wine-tasting." I enjoyed every day of the Switzerland tour and have so many wonderful memories. The country is amazingly beautiful and the tour brought us to a variety of charming towns and mountain villages. Our tour guide, Maisie, has such a great personality with a good sense of humor and is also a good communicator and full of knowledge. The other members of the tour were all fun to be with to and share experiences with. This was my third Rick Steves tour and I am already thinking about the next one. "Every day seriously included a "wow" moment but I would say visiting a cheese farm on the side of a hill surrounded by the open meadows and distant snow covered peaks was indescribably beautiful. Sitting out in the warm sun and eating from a beautifully presented cheese platter was magical. I also enjoyed starting our tour in the charming town of Lucerne. Located on a lovely lake with mountains surrounding, the cobblestone streets with picturesque buildings and bridges was a perfect place." This was our 4th RS tour and it did not disappoint. Our fellow travelers were great, the bus driver was outstanding and Maisie was fun and very knowledgeable. "Seeing the Matterhorn was one, visiting a farm on an Alpine Meadow was another, the whole tour was "wow"." Wonderful. The group members got along well. The guide was knowledgeable, organized and efficient. We were on time with departures and arrivals. Hotels were mostly good. Food not great. And Switzerland itself was magnificent! "It has to be moments. Seeing the Matterhorn on a sunny day! The view from my room in Murren! The view from the top of the church on San Salvatore! Looking back over the Grimsel pass." The tour was well organized and informative. Maisie was always pleasant, knowledgeable and helpful. The local guides were exceptionally knowledgeable and informative. It was our first time to Switzerland but it seems that we were privileged to see many cultural and scenic places that represent the varied country of Switzerland. The planned time on our own helped make the tour more personalized. "There were many. The experience of being at the Shilthorn and taking in the massive scenery. Riding cable cars in full sunlight and full fog. Being able to see the Matterhorn with small clouds forming behind it. Traveling around an through the mountains. Learning and seeing how multiple cultures and history have come together to link past and present." The tour pushed much too hard, trying to see far too much and driving the tour participants far too hard. The tour needs to be significantly refashioned to slow down, allow people a chance to breathe and see stuff without the next deadline and the next move looming over them. We would far rather stay longer and see more in depth than try to see all of Switzerland through bus windows. But it was a once-in-a-lifetime experience and our tour guide, Donald White, was extraordinary beyond words. "The day spent at the Schilthorn and breakfast at the restaurant." "Hiking the North Face Trail and breakfast at 10,000 feet." I liked the tour. It was a good experience to see a small country that has the diversity of German, Italian and French cultures. "I think the time spent in Zermat, with a folk parade and the Matterhorn." This was the first tour I have ever taken. We have only ever traveled on our own. It was a great tour with a wonderful guide and wonderful activities. "Seeing the Swiss Alps...so not one particular moment." Our first Rick Steves tour was a real pleasure and has us eager for more. In the past we planned our own travel experiences and it was so great to leave all the logistics to others and just sit back and enjoy every wonderful day as the incredible alpine scenery wowed us from our bus. Our guide, Donald, was truly amazing, and the great experience we enjoyed is largely due to his terrific "people skills" which include humor, patience, organization and a deep knowledge of the places we visited. "It's almost impossible to choose just one or two places or activities because every day brought something or someplace that was beautiful or interesting or both. Visiting an alpine meadow farm and seeing and then tasting cheese made from the milk from that morning's milking was amazing. And the bus rides through the alpine passes were stunning! Towns like Lugano, Lausanne and especially, Murren and little Gimmelwald were charming and quaint and fun to explore." Switzerland is a beautiful country. Our tour guide was great and provided additional assistance when needed. There were some places that needed additional time to visit instead of rushing off to the next stop (i.e., Engleberg could have been skipped and more time in Luzern or Laguno). This was our 1st Rick Steves tour. I had a wonderful experience. I appreciated the free time I/we had at the end of our day. "Breakfast at Schilthorn was just breathtaking. Ours was one of the 1st groups so we had fantastic views of the mountains as the sun was beginning to rise." Great guide, interesting things to see and places to visit and all around a great time. "Riding the gondola up to the Schilthorn, gorgeous views, the rotating restaurant and the James Bond "museum", time to explore on our own-a perfect day." For years I have wanted to see Switzerland so it was quite built up in my mind and imagination. There's always a fear in such situations that it will be impossible for reality to live up to your imagination. My 12 day Rick Steves Switzerland tour exceeded all that I was imagining. The mountains themselves are beyond description. I would change the tour by including more mountain days. "Seeing Jungfrau, Monch and Eiger on a crystal clear day from the Shilthorn." beyond all expectations. The tour was wonderful. We didn't feel rushed, had plenty of free time. The hotels we're comfortable. Most places we stopped at on this tour were interesting, informative, just a joy to be there. Donald, our guide couldn't have been more prepared, organized, helpful knowledgeable if he wanted, we we're very happy to be on his tour. My husband and I had to keep pinching ourselves that we we're actually seeing all these beautiful places that we'd been talking about. "Oh my which one. There were so many wow moments. I think when we walked out onto the balcony of our hotel in Murren. It was like a postcard staring back at us. The alps in our reach. Also the Folklore parade we experienced in Zermatt. Just wonderful." Exactly what I've come to expect from a Rick Steves tour. "Seeing the turquoise color of the the lakes." Every place we went was worth a visit. We probably didn't make any permanent friends, but we got along well with the other members of our group. Our guide was really good. And I'm pretty sure our driver was some kind of magician. I wouldn't hesitate to recommend a Rick Steves tour to my friends. "My favorite moment was the glorious, clear day in Murren and the views from the North Face Trail." Donald, our guide did an excellent job providing the history of the various cities and scheduling activities that were exceptional. As always I always enjoy the tours. "Having breakfast at the top of the Shilthorn and being able to view the Alps from our table. Tha view of the Alps was spectacular. Also hiking and enjoying the view on the North Face Trail was beautiful as well. I also enjoyed the festival and Matterhorn in Zermatt. The tour guides in the various cities and sights were excellent as well." Tour was outstanding. Maisie knows her stuff and she was always on her game. It was a nice group of buddies. Would of liked shorter boat ride to spend more time at castle. No transportation center. Three night in Murren is MUST..Murren sells this tour.. went on GAS in 2014. Murren brought us back. City guide in Bern was five stars..She was nice always smiled and most importantly new her "Switzerland " she knew it all. Dominic was a great addition very personable. Maisie handled hipcups well. "By far Murren.. that is the only reason we came on this tour. Please please add another day to Murren.Murren is Switzerland . Luzern could have one more day too. We had arrived three days early and saw so much that others didnot see. We went up the mountain there. Well worth it." We had been to Switzerland before on GAS tour and loved Murren so much it brought us back. We enjoyed Luzern we had arrived three days early.. we saw everything. Did the mountains (outstanding) went to the "Blue Balls" concert. Watched the fireworks for hours on our balcony with wine and new buddies. Tour was great just needs a tiny tweaking. More time in Murren..Murren scream Switzerland.. I would add a day there. I think everyone on our tour would agree. "Seeing Murren and hiking the Northface hike. Listening to the cow bells as I hiked... I recorded them in hopes of making it my ringtone." We saw many wonderful sights in Switzerland, sometimes we were too rushed to fully enjoy them. An example would be Chateau de Chillon, The Olympic Museum. Loved the whisper system and making friends as we toured Switzerland. Still can not believe how beautiful it was everywhere we went! It was very fun to have Dominicthe photographer on our tour! He brought in a whole new dimension of fun every day! LOVED IT SO MUCH! I can not wait to take another Rick Steves tour! "Waking up in Mürren in a room with a view of Eiger, Mönch, and Jungfrau! WOW!! It was "make you cry" beautiful!! I had a feeling Rick Steves would show up! AND HE DID! He popped in at our Farewell Dinner in BERN! That was so exciting! He was so kind. He spoke to everyone at the table! That was the frosting on the cake!! 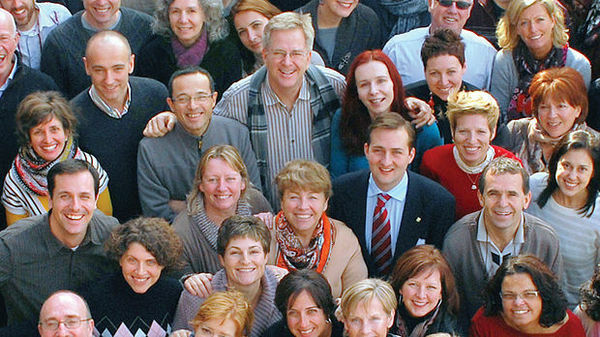 :)"
This was my 2nd Rick Steves tour. I loved everything and it exceeded my expectations. I don't know how you would improve any part of the tour. Just fabulous on every aspect. My tour group was delightful and an enjoyable, fun group. Already planning my next tour for 2018 and getting excited just reading about the various trips. Thank you all for the top notch planning, guides, hotels---everything. Great. I'd been in Switzerland many times years ago. Loved speaking German and French with native speakers. I love Switzerland, my ancestors hailed from here. "Getting out of the stalled cable car enroute to Mt. Titlis and finally standing at the summit on a disturbingly hot day." I totally enjoyed the trip. There was a good mix of free time and included meals. Maisie did a great job of corralling 20+ people to be on time. The buddy system worked well. Dominic was also a real plus. I would have liked to stay in Murren for two nights. This trip is my first with Rick Steves and I plan to go on more. Having just one tour of a church was fine. If there were more, I probably would be bored. I really enjoyed going to Pilatus on my own since I was there one day earlier. "Looking out our window and seeing the three peaks in Murren." This tour certainly provides you with a wide variety of experiences across the majority of the country. Our guide Maise provided a wealth of knowledge, kept us moving forward on the aggressive timeline, and introduced us to some wonderful local guides. For those considering this tour in the future, I would suggest an extra day in Lucern and an extra day in Bern. Both cities are beautiful and the extra time will allow you to explore areas not covered on the tour. "My favorite wow moment (from over 10 to choose from) was getting to the top of a mountain pass, after a long rainy drive and seeing a beautiful rainbow...from the top! Our vantage point provided us a view over the top of a rainbow spanning the width of a valley. It was breathtaking." Most tour members arrange to fly in and out of Zürich International Airport. Zürich is a 90-minute train ride to Luzern where the tour begins, and a 75-minute train ride from Bern where the tour ends. You can also arrange to fly into Zürich and out of Bern ("multicity" on flight-booking websites). We suggest arriving a day or two before your tour begins to allow ample time to get over jet lag and be well-rested for the first few days of your tour. For more information about transportation options for getting to and from your tour, see your Rick Steves Switzerland guidebook.